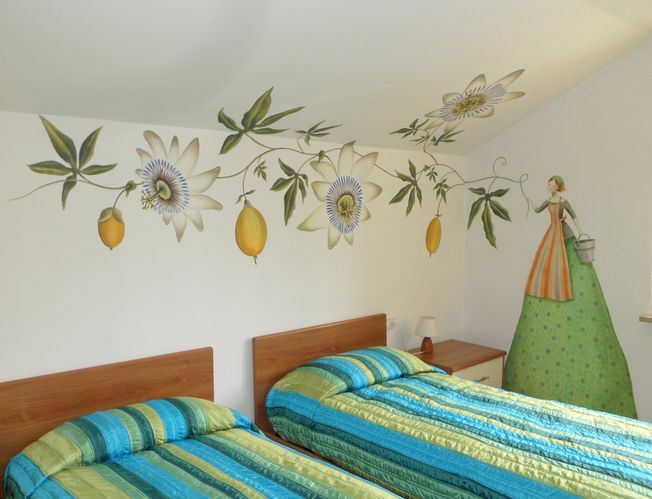 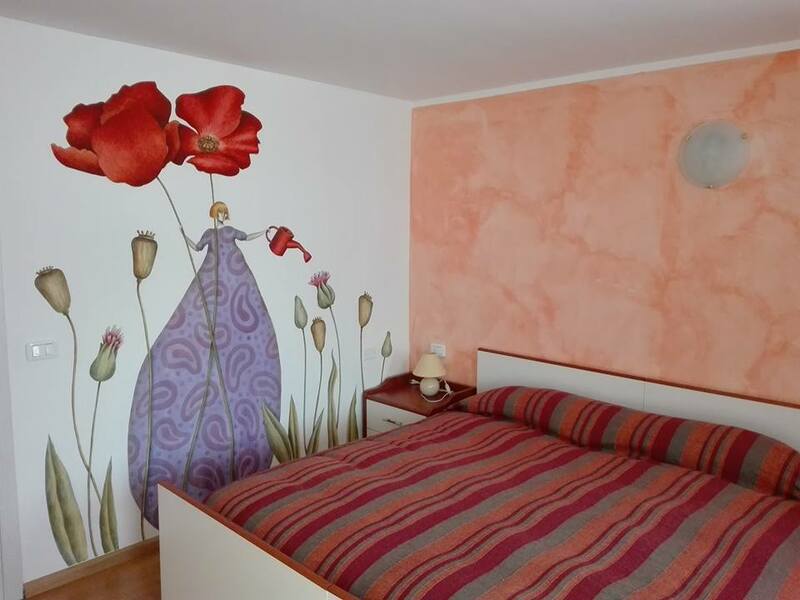 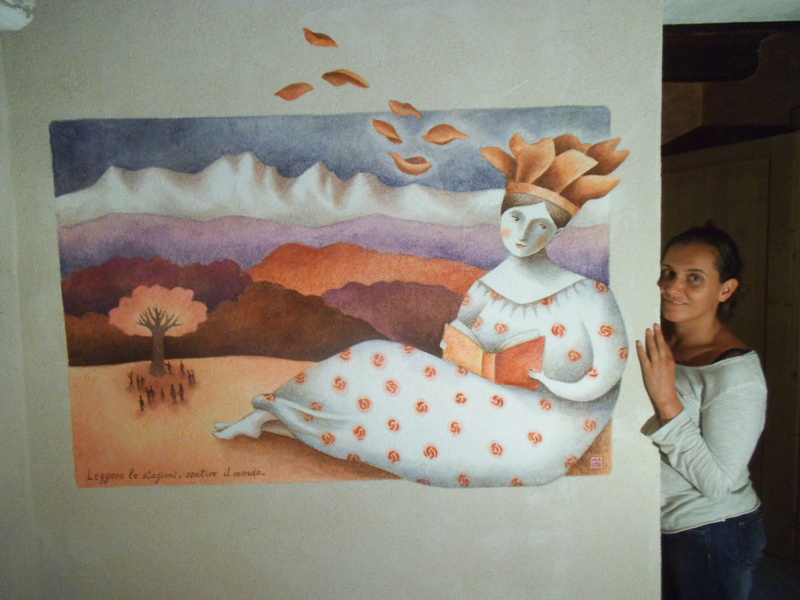 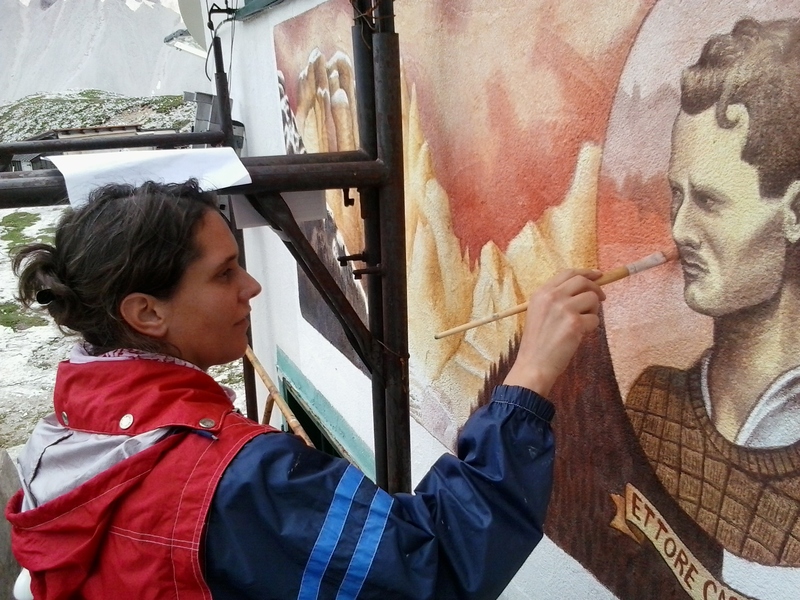 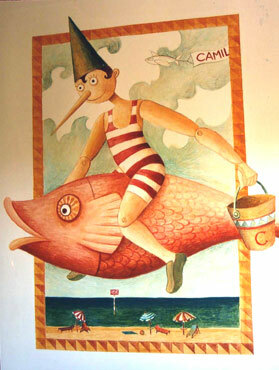 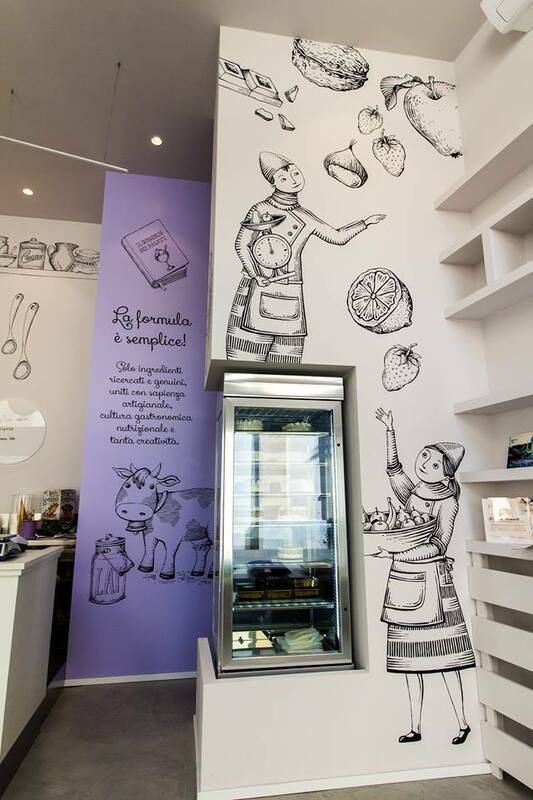 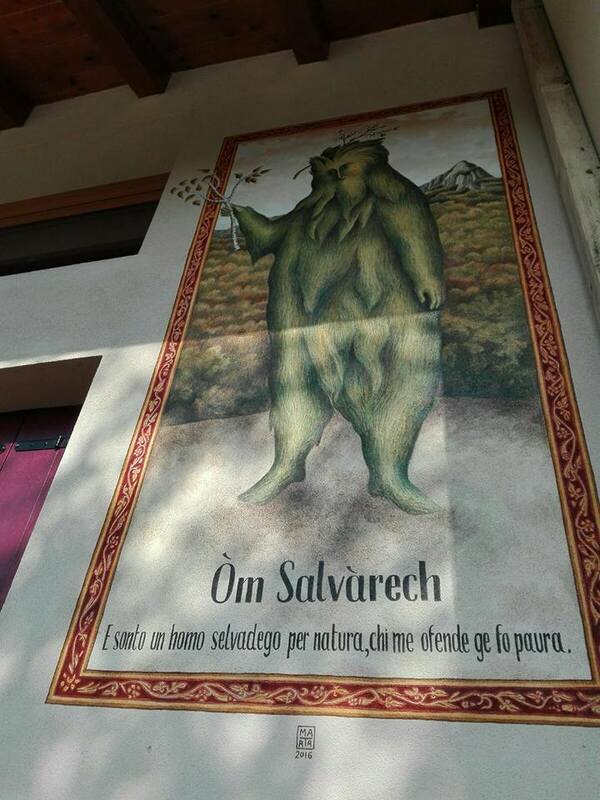 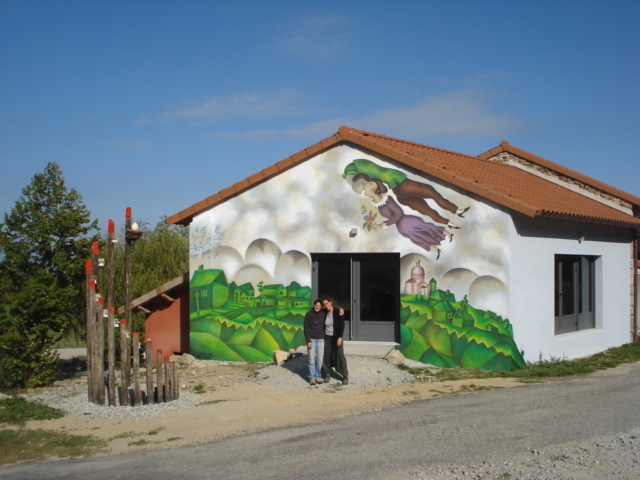 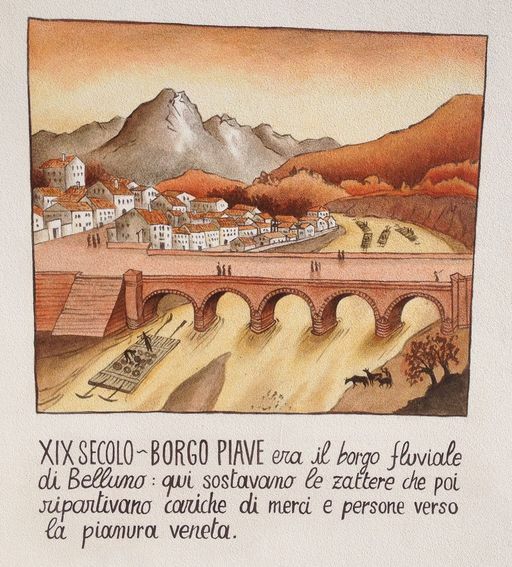 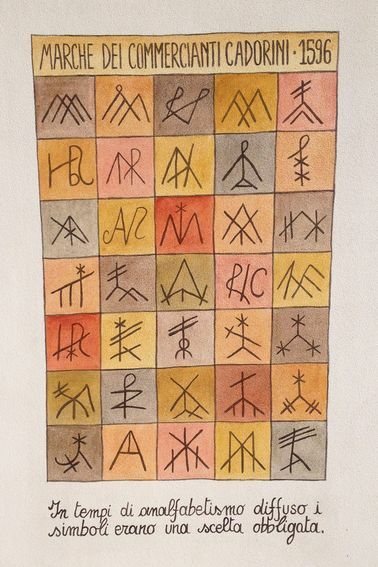 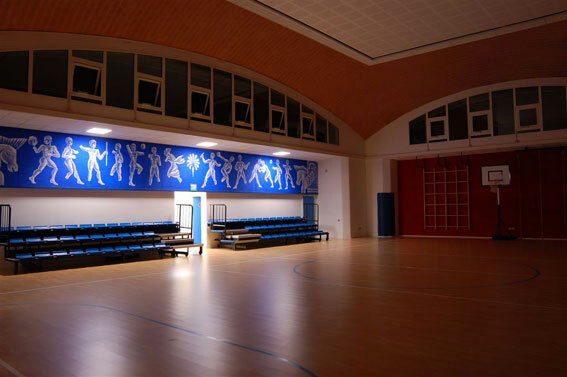 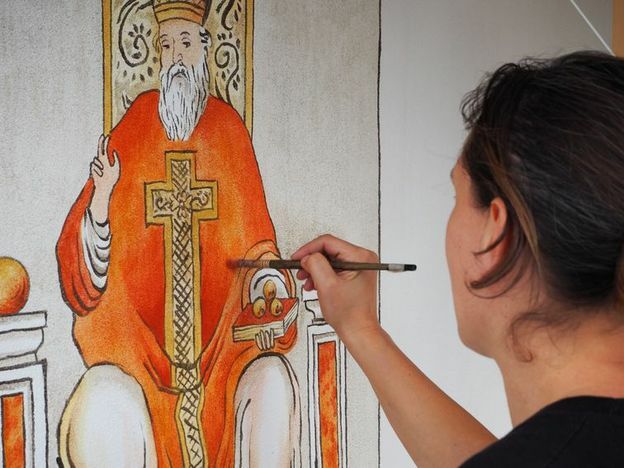 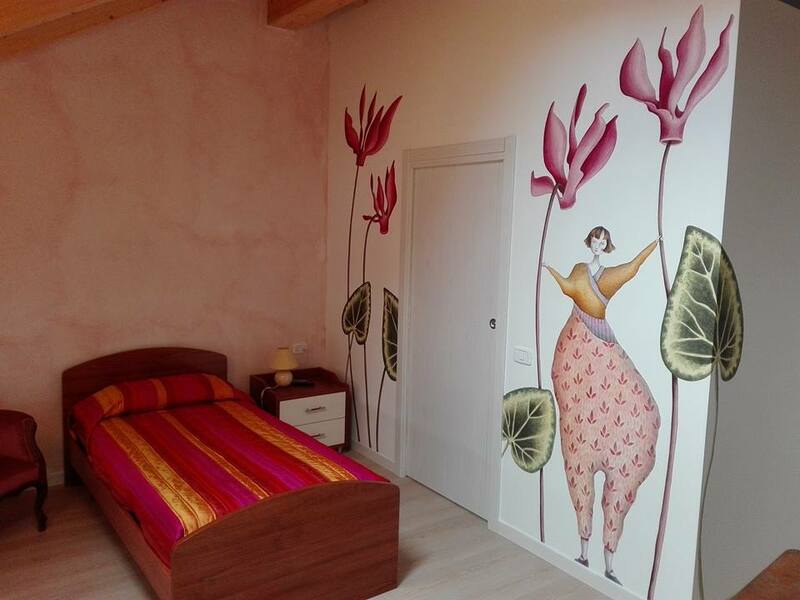 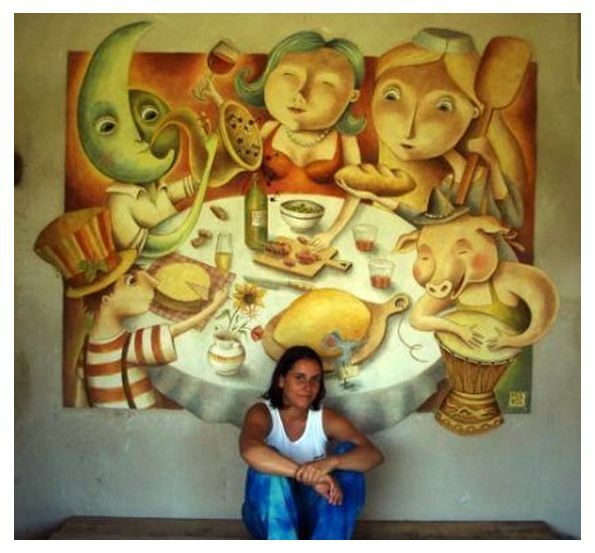 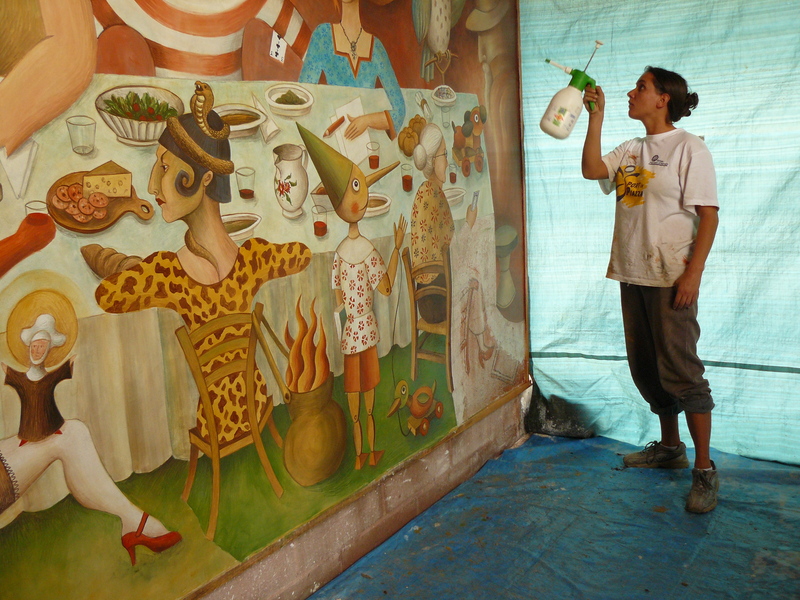 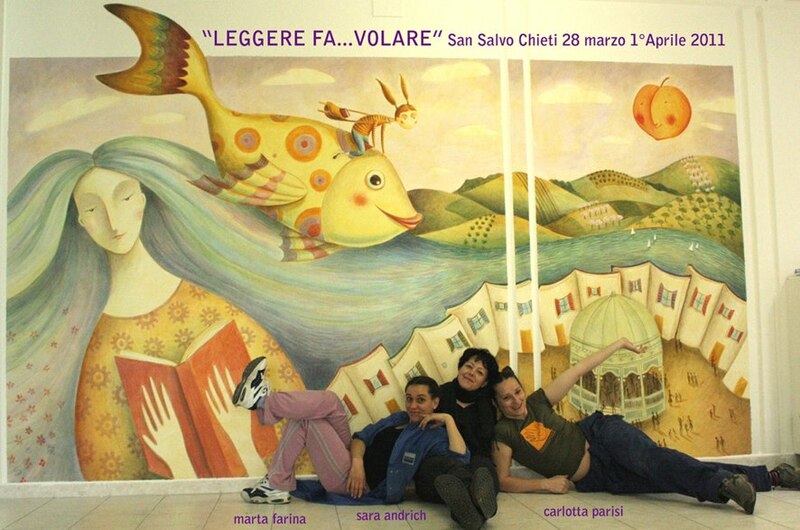 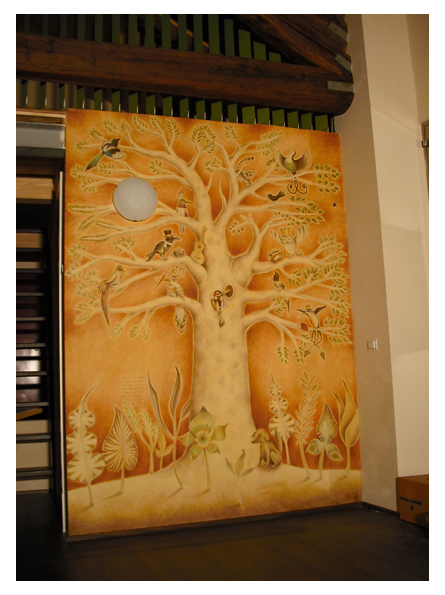 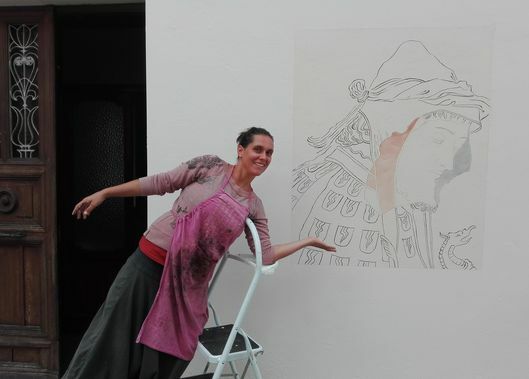 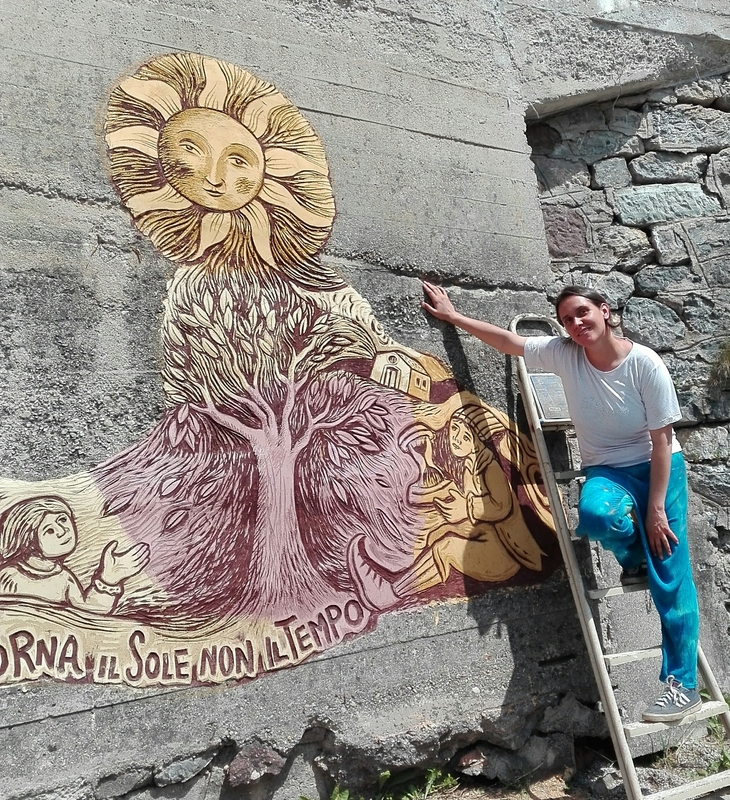 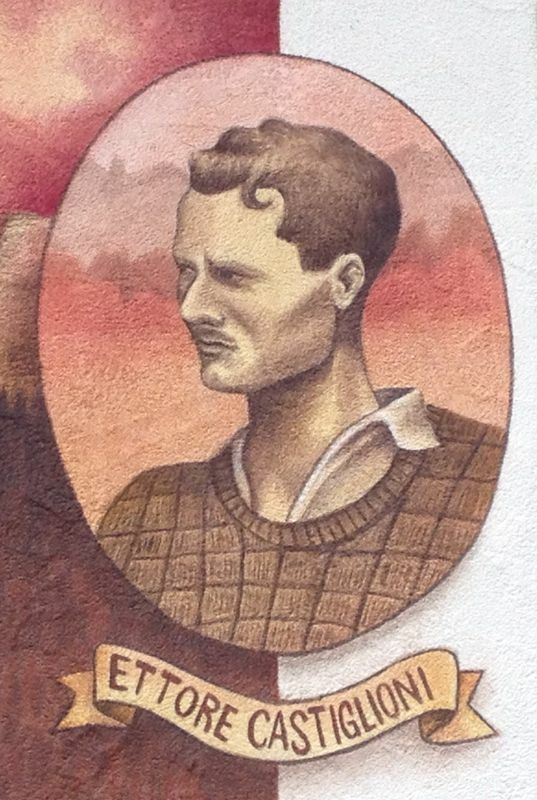 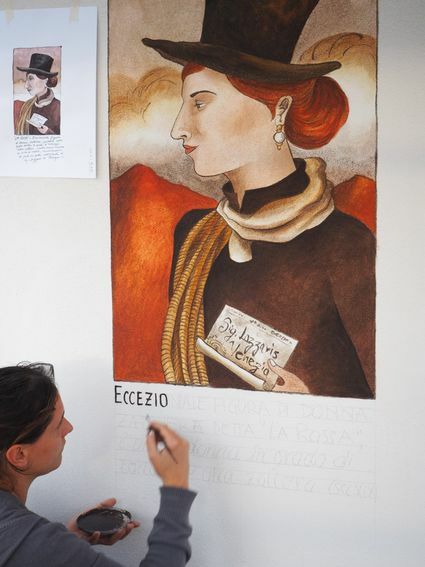 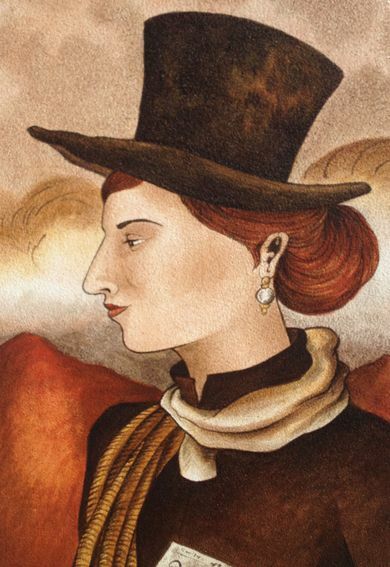 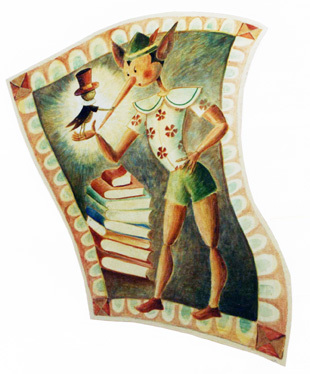 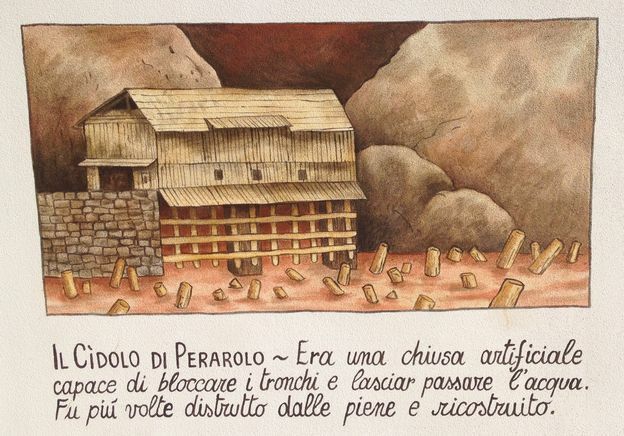 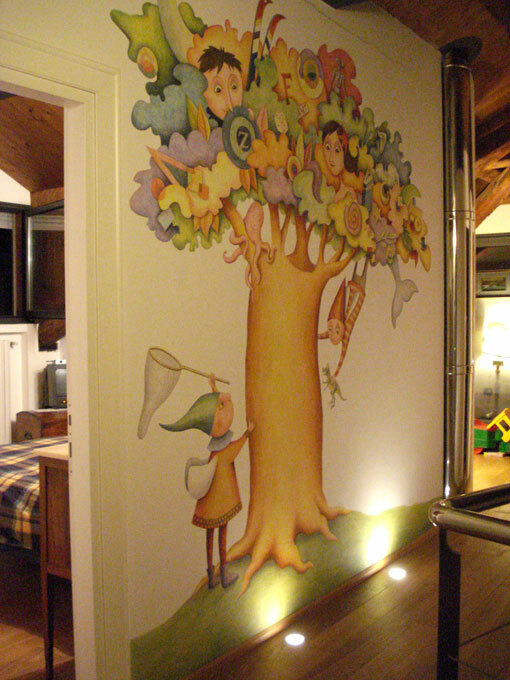 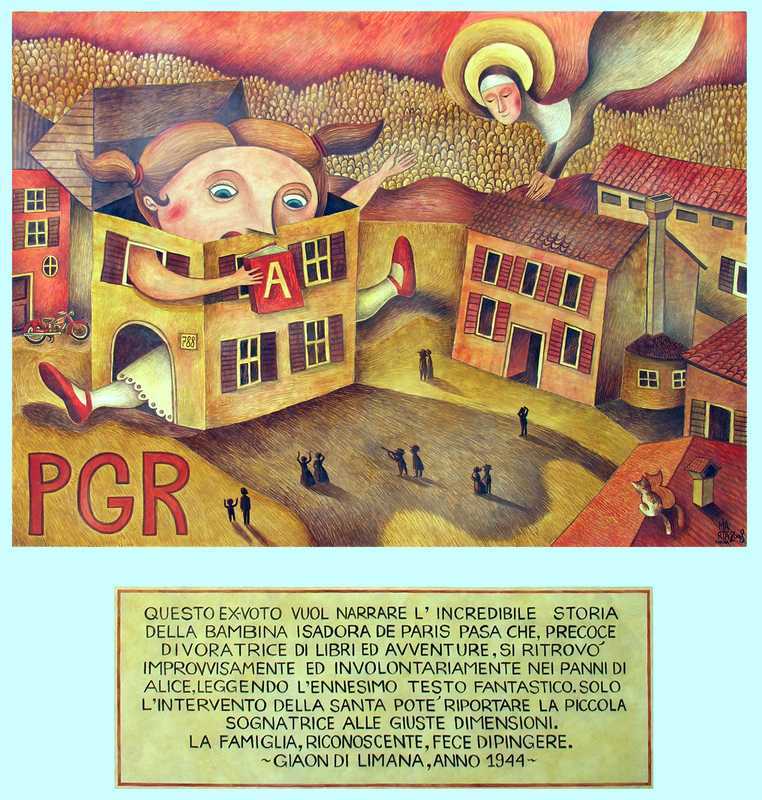 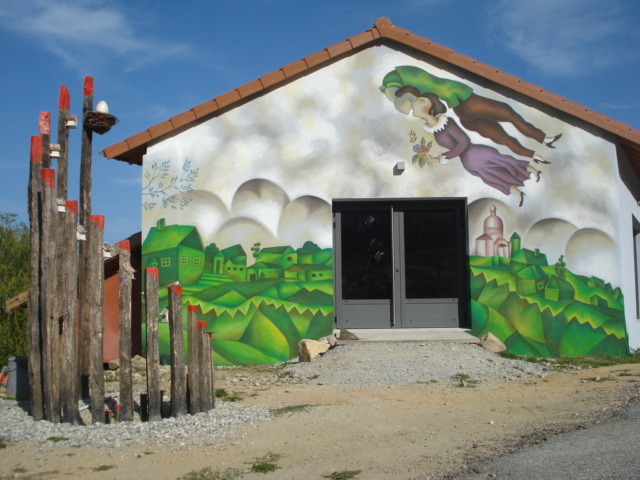 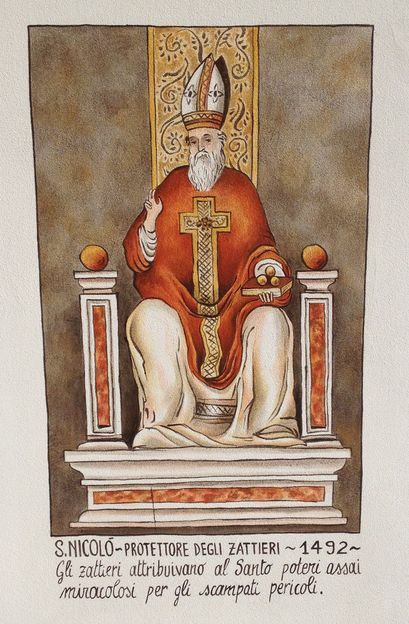 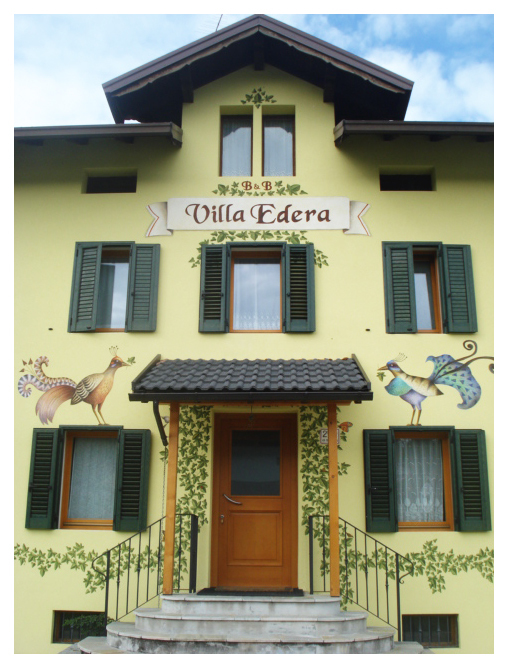 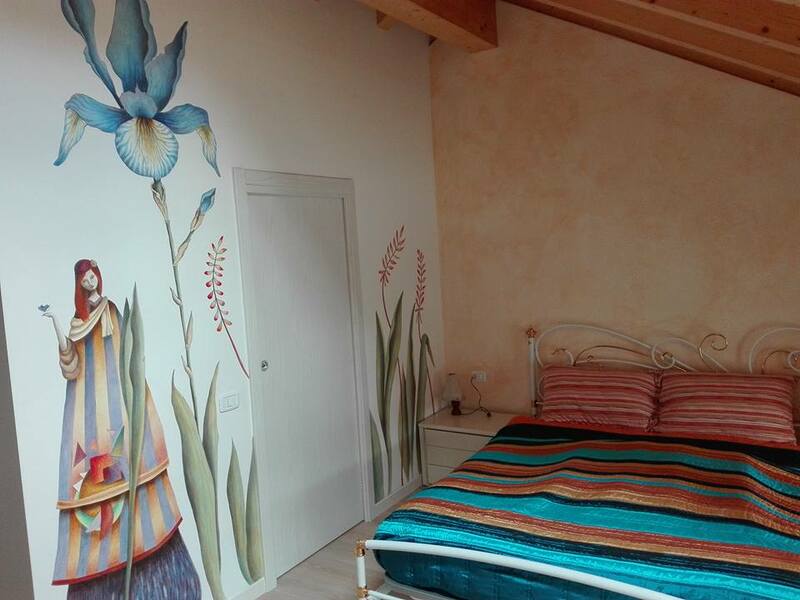 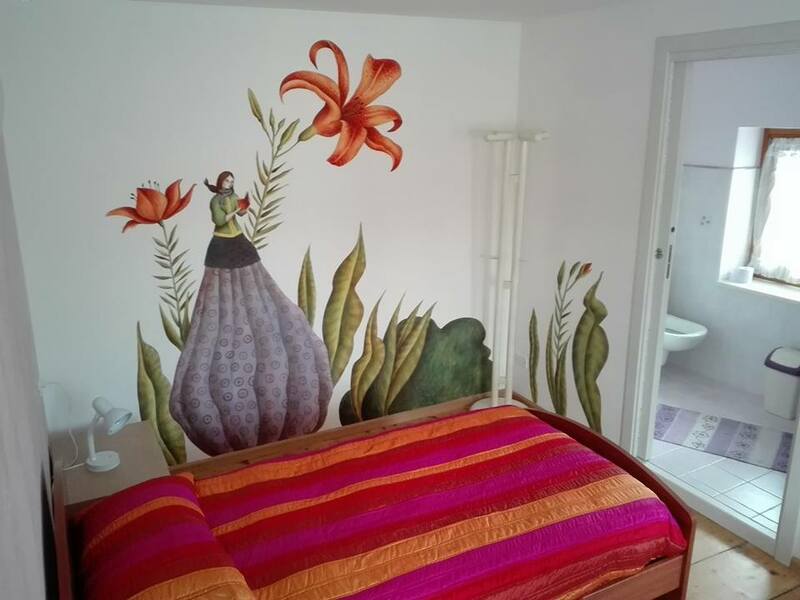 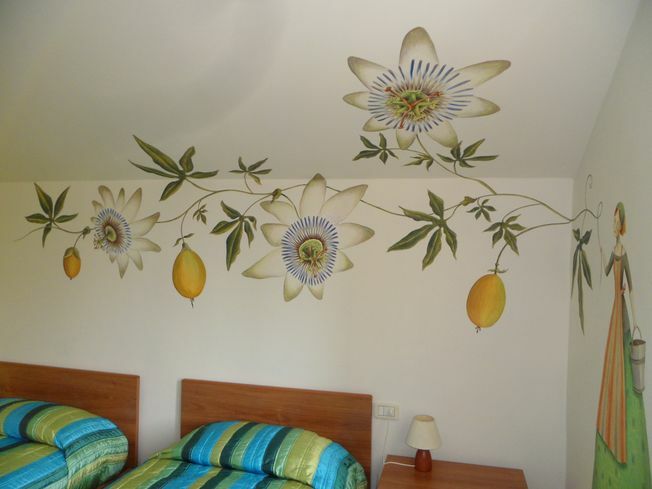 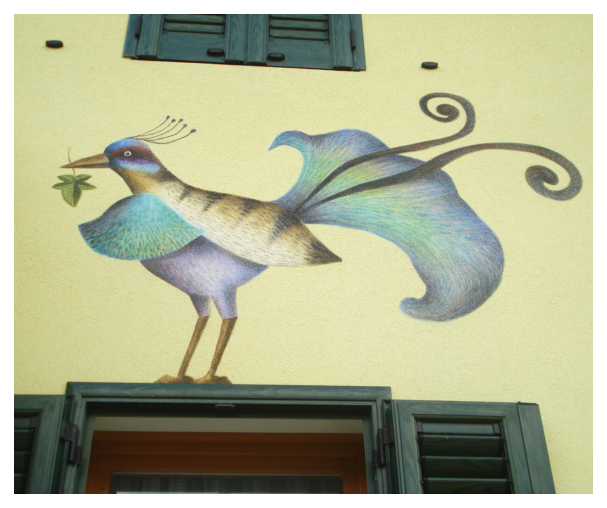 Since 2004, the year in which I studied various wall-decoration techniques (including fresco, which I learned from the well-known fresco master Vico Calabrò) I have never stopped to paint walls. 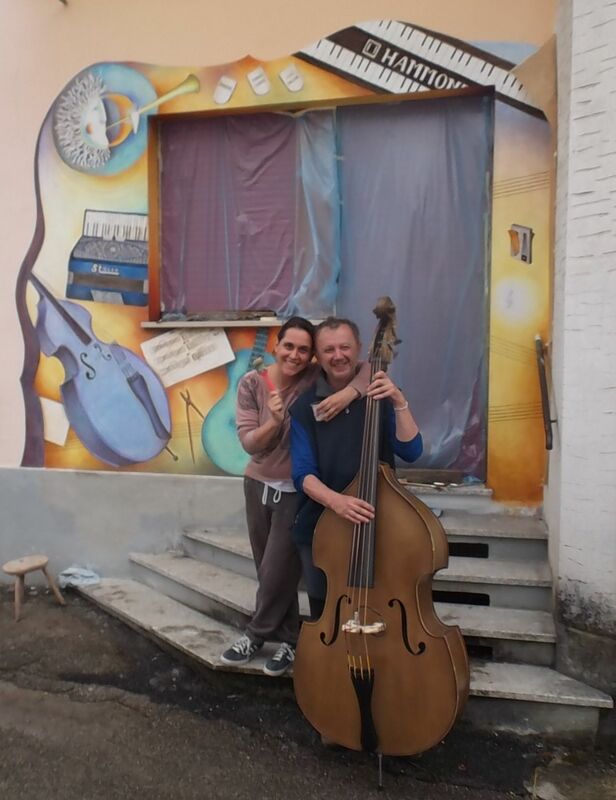 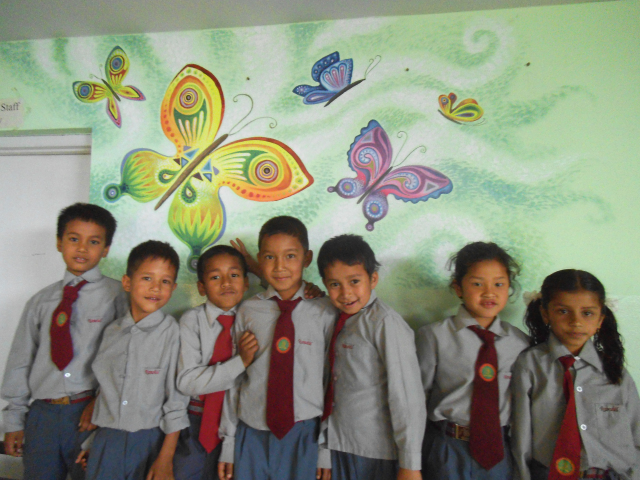 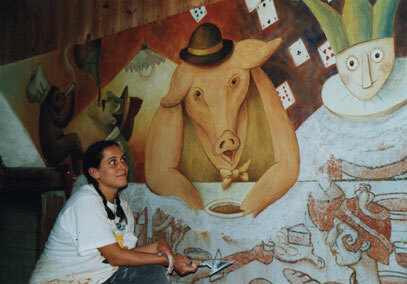 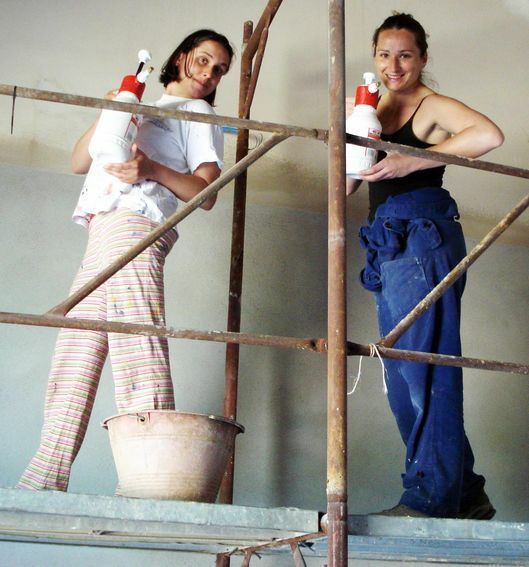 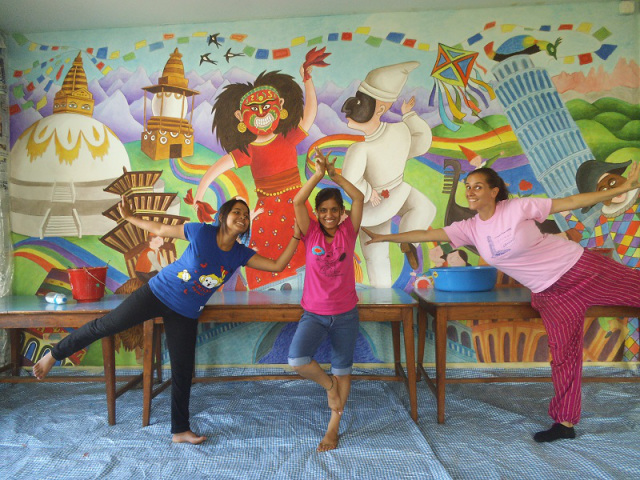 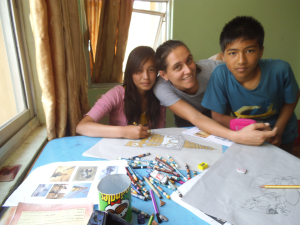 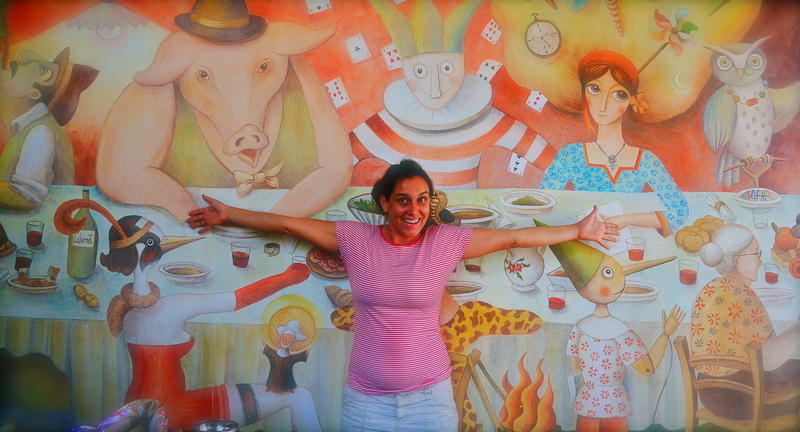 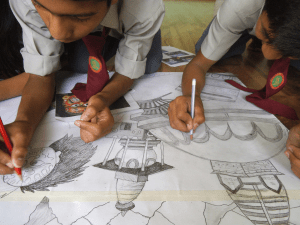 This passion led me to paint well beyond national borders, with murals also made in France and Nepal. 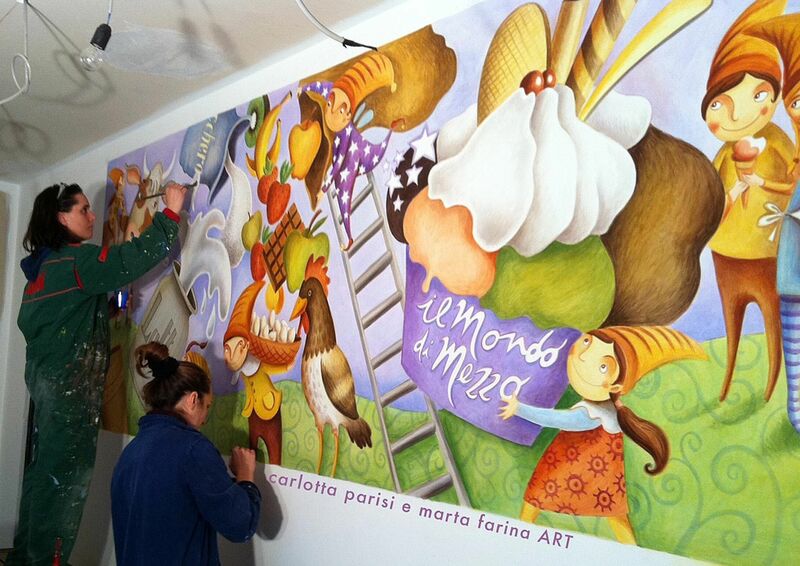 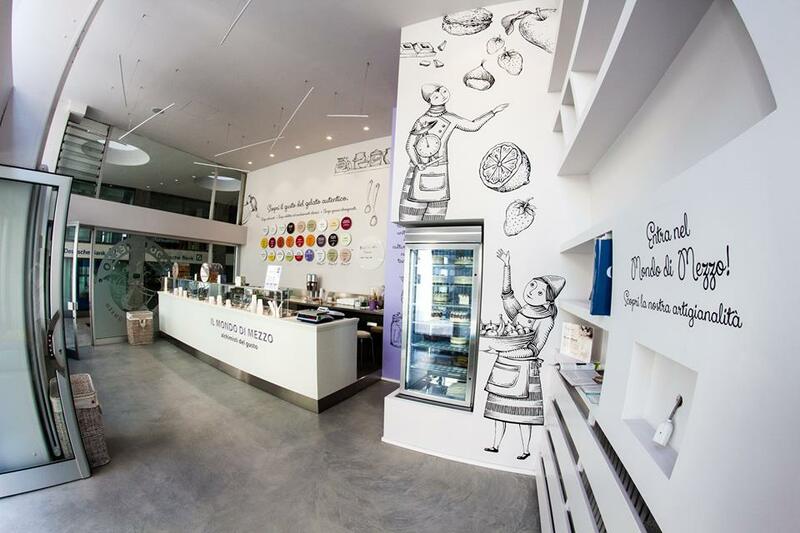 I also love very much to collaborate with other artists to create new murals. 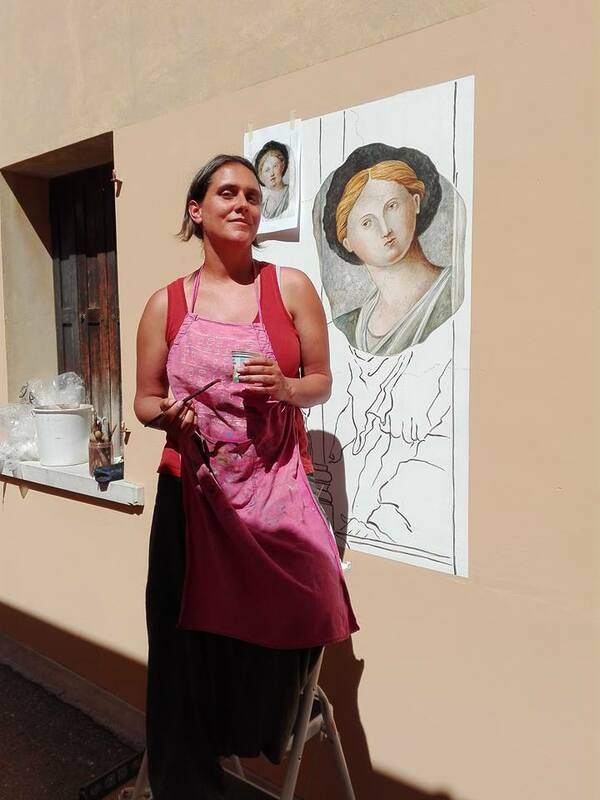 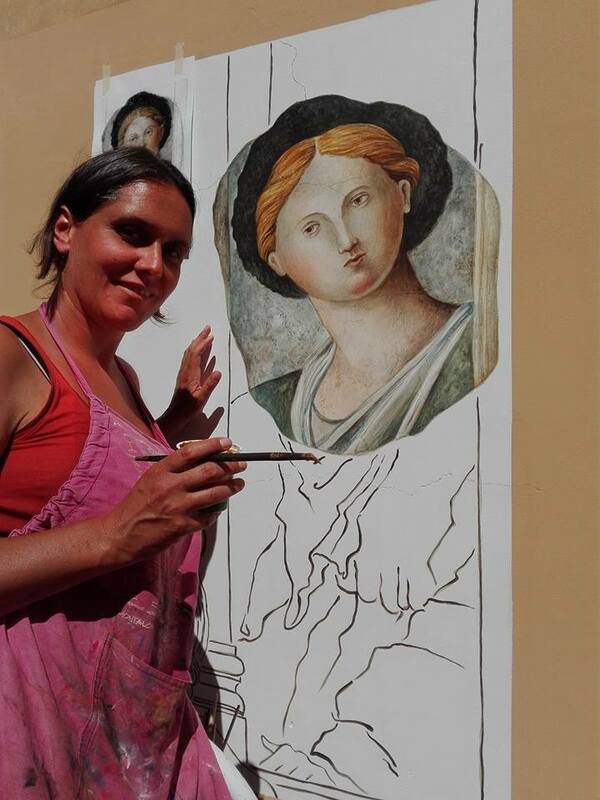 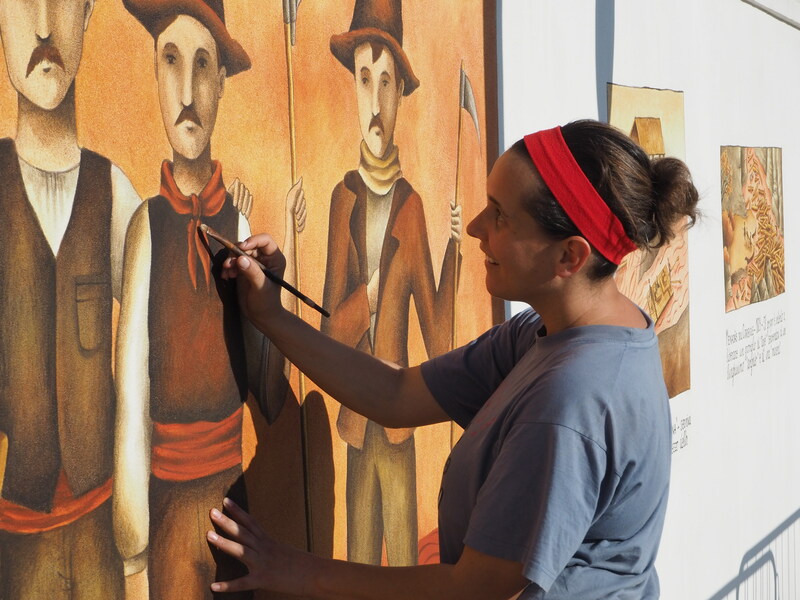 Painting frescoes is an essential part of my artistic activity: I like nothing more than create images and stories, first on paper and then on walls, through the use of powders and pigments. 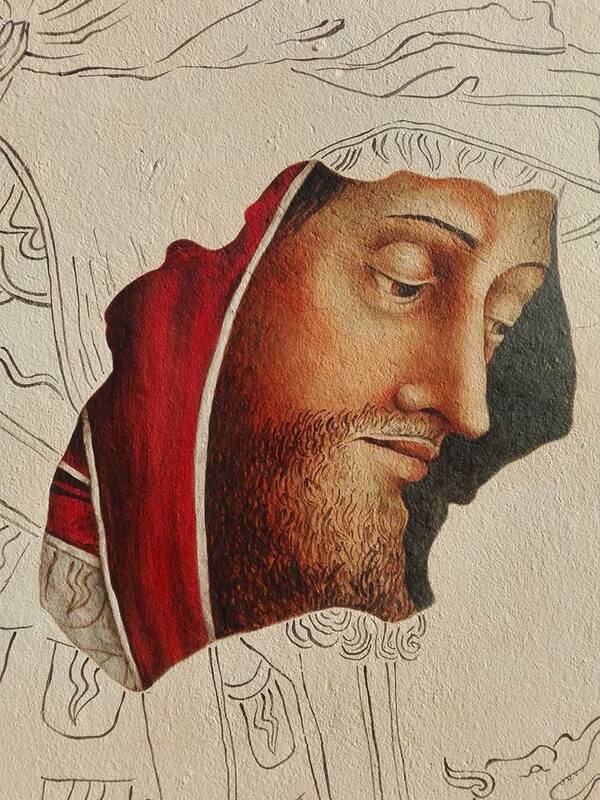 Every works is created to remain there where they will be painted, to be given as a gift - in the deepest sense of the word - to every passerby. 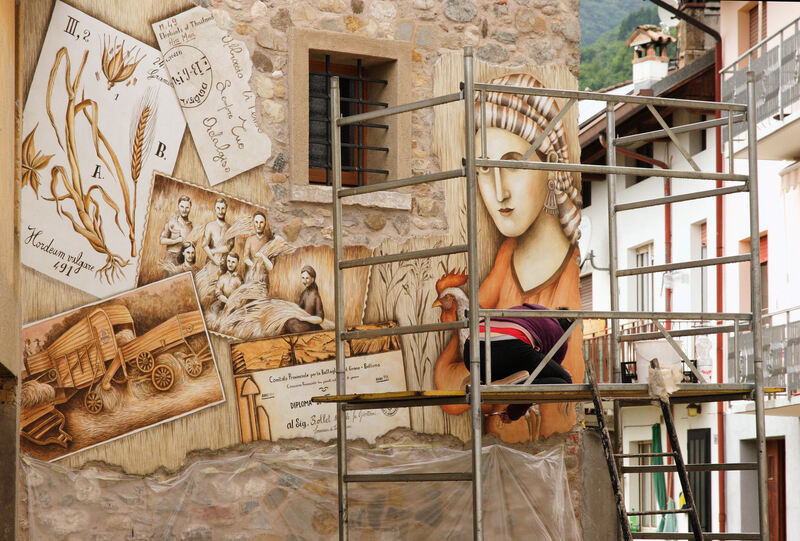 Born from legends, historical research or pure and fantasy, the frescoes finally become the common heritage of the city itself: they are nothing but beauty to share, through the stories that they silently can narrate to anyone who passes and take a look up. 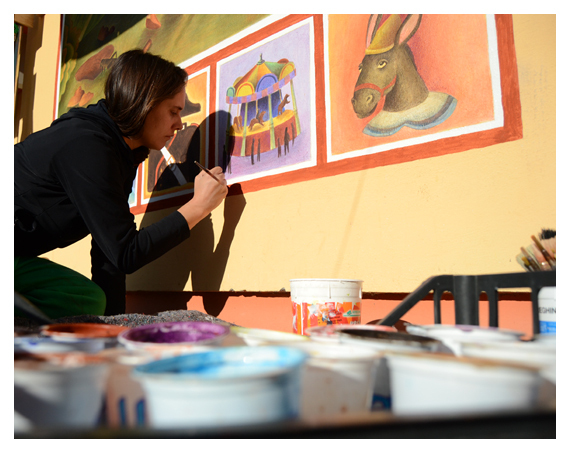 I created this painting project to redevelop a central area of my hometown damaged by graphics vandalism acts. 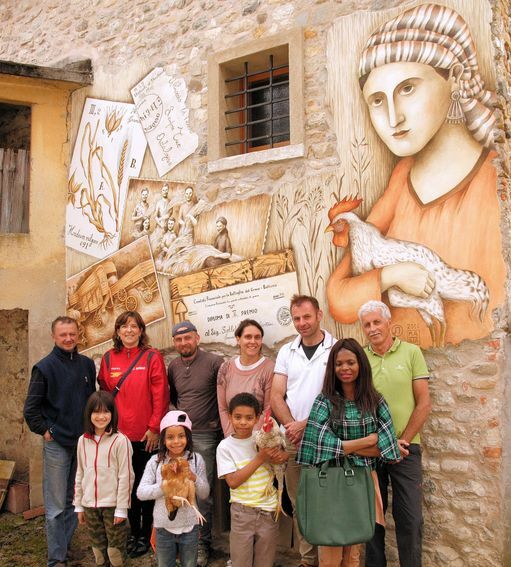 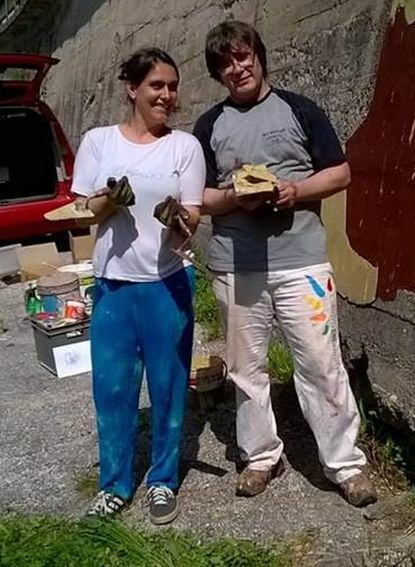 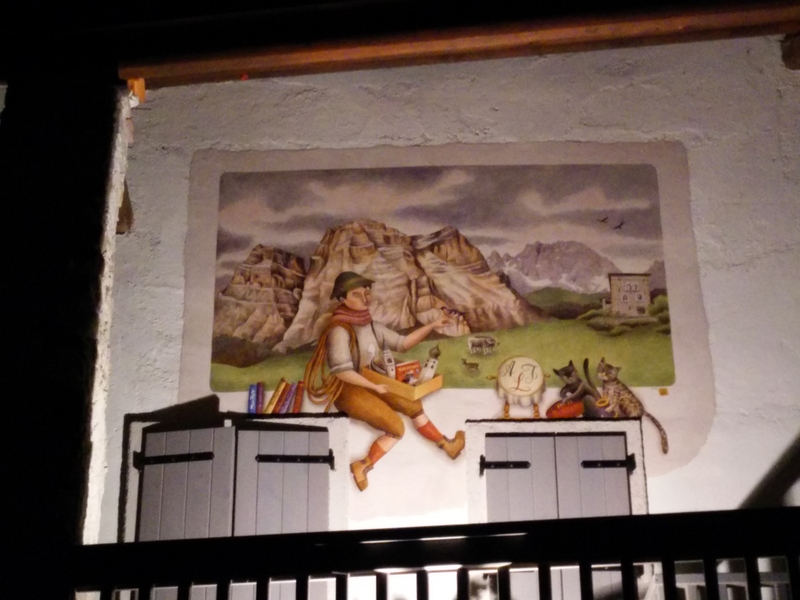 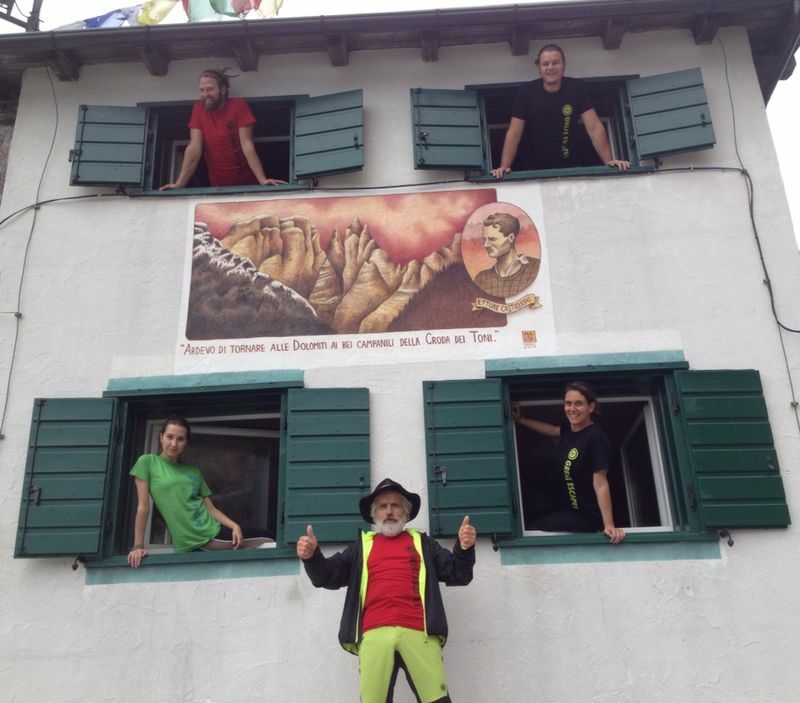 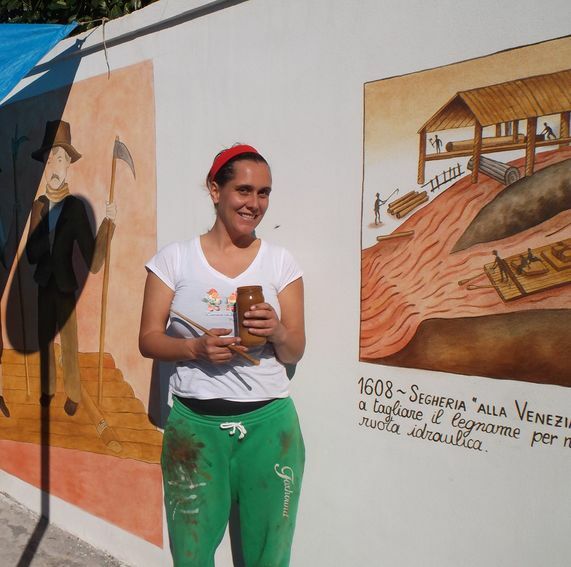 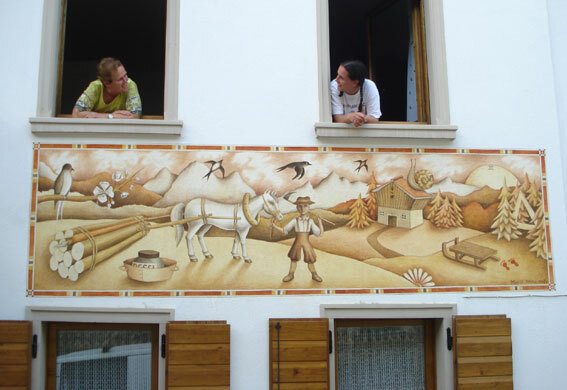 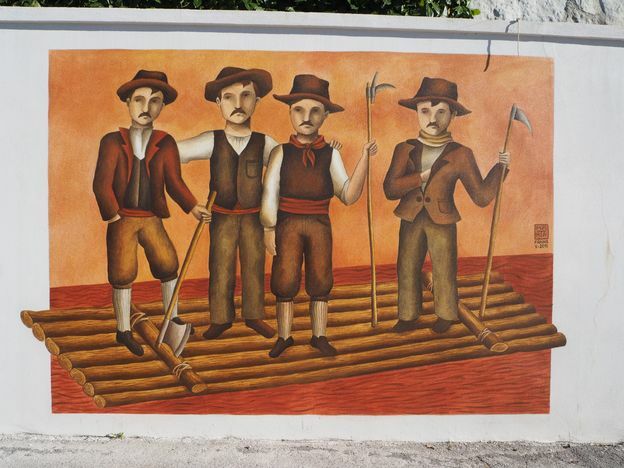 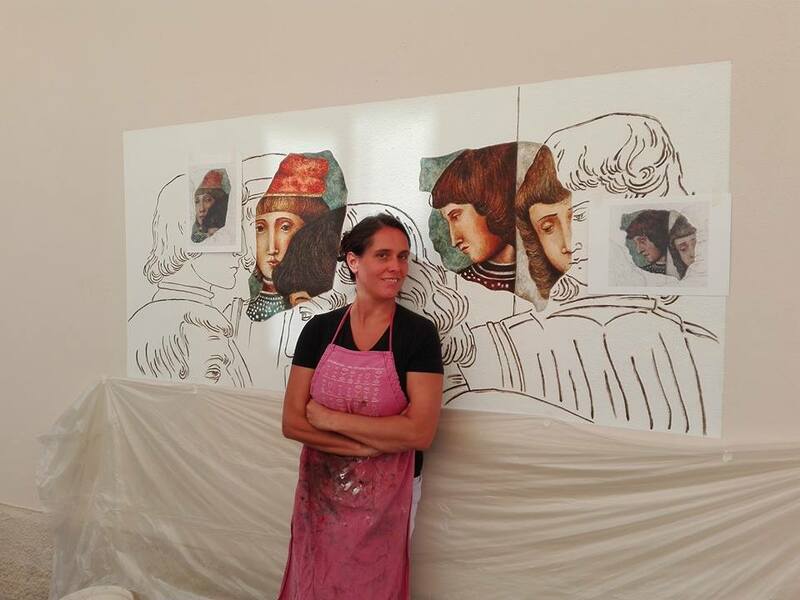 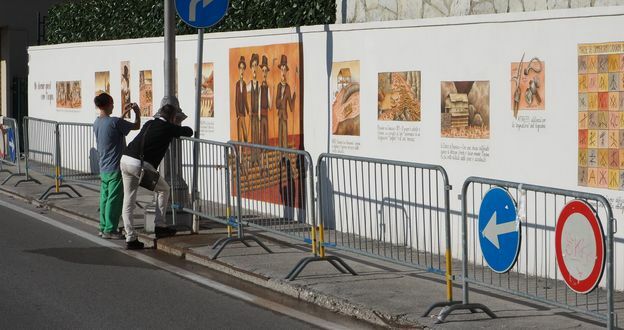 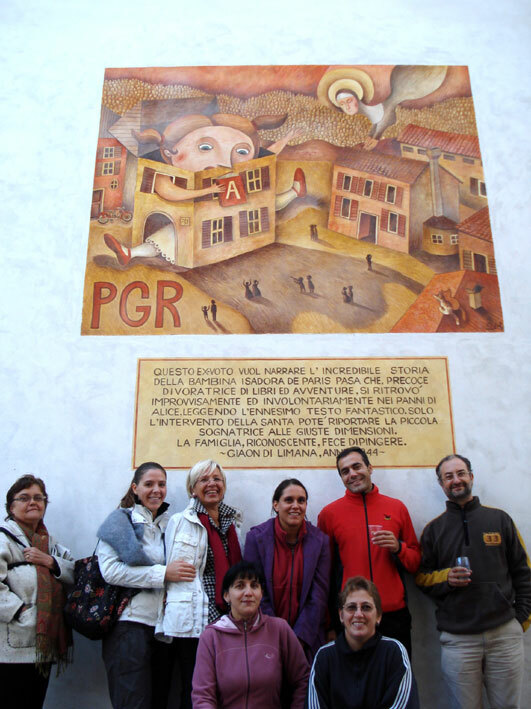 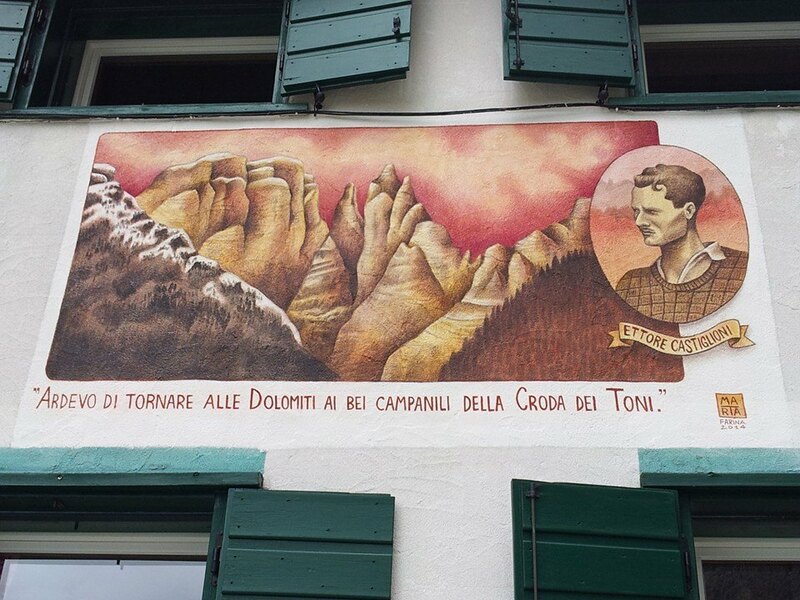 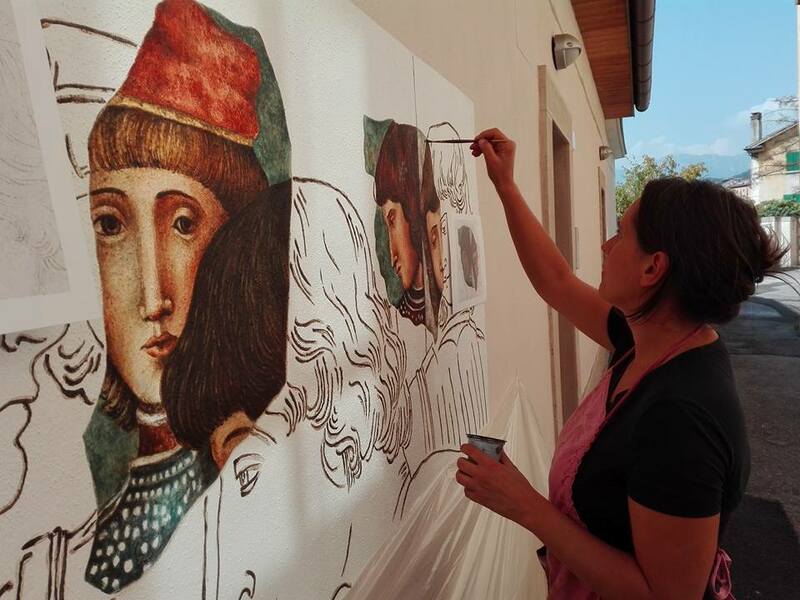 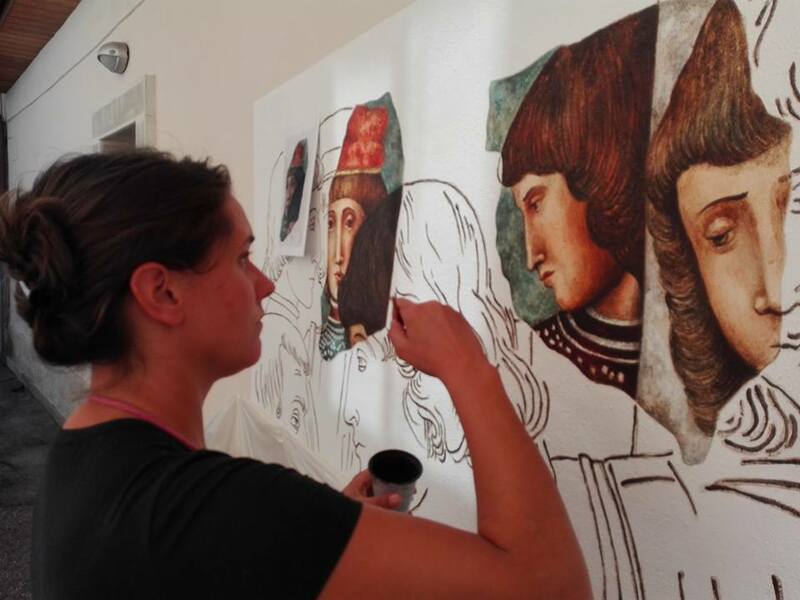 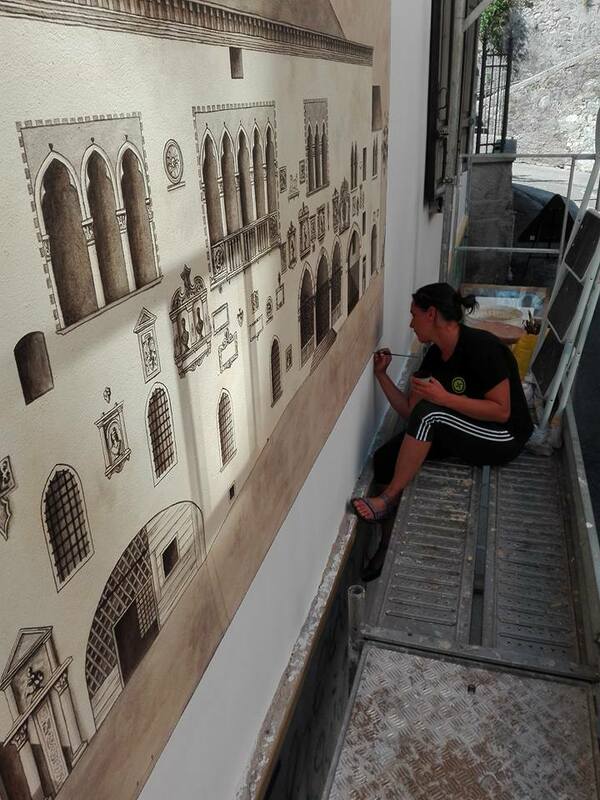 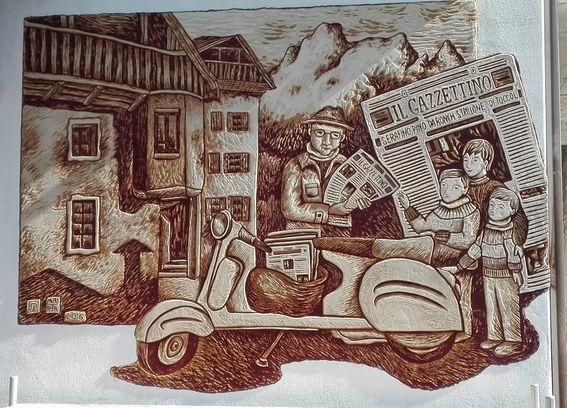 The walls of Sottocastello road (Belluno, Italy) were repainted and than I decorated those walls with a series of reproductions of ancient fragments of frescoes. 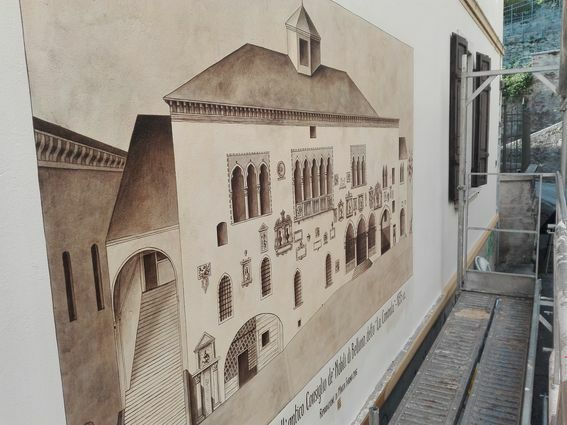 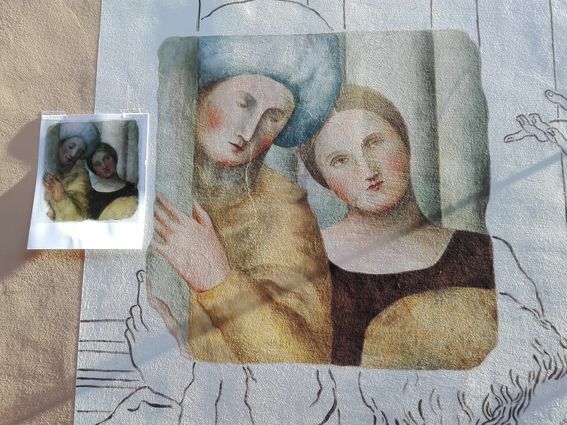 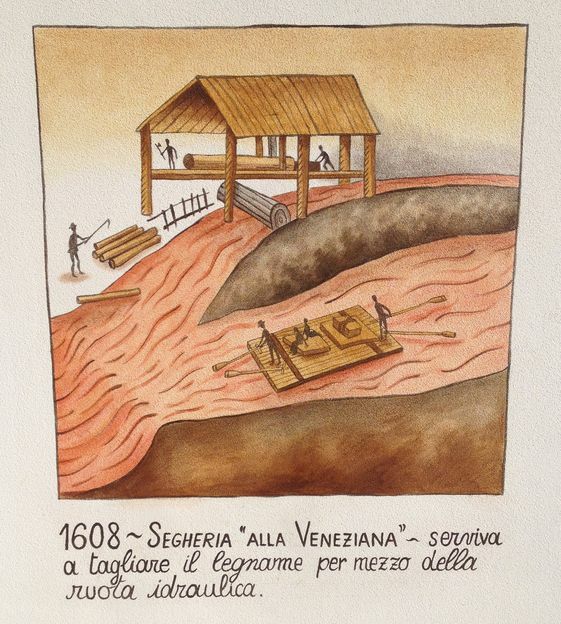 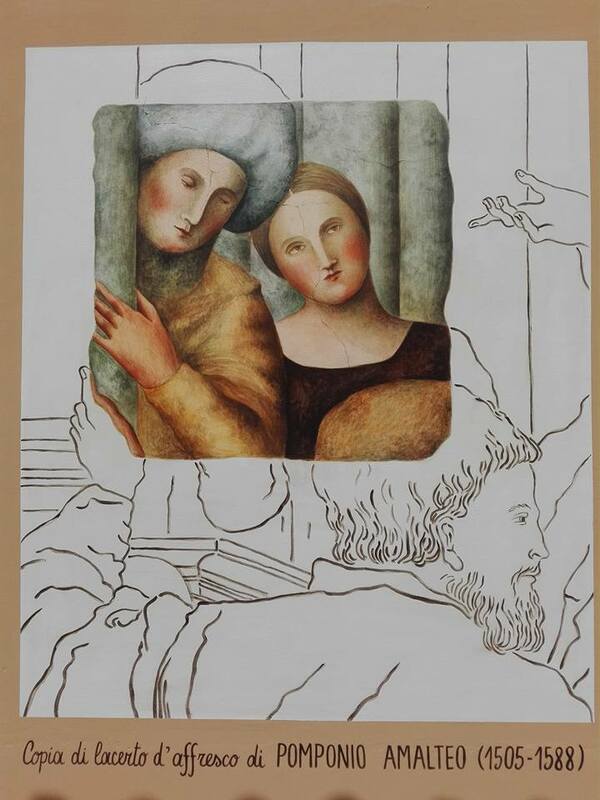 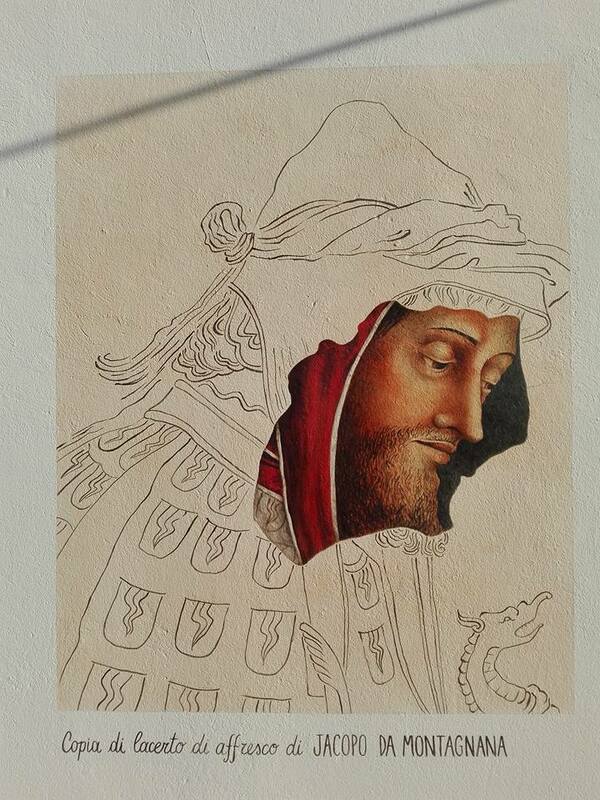 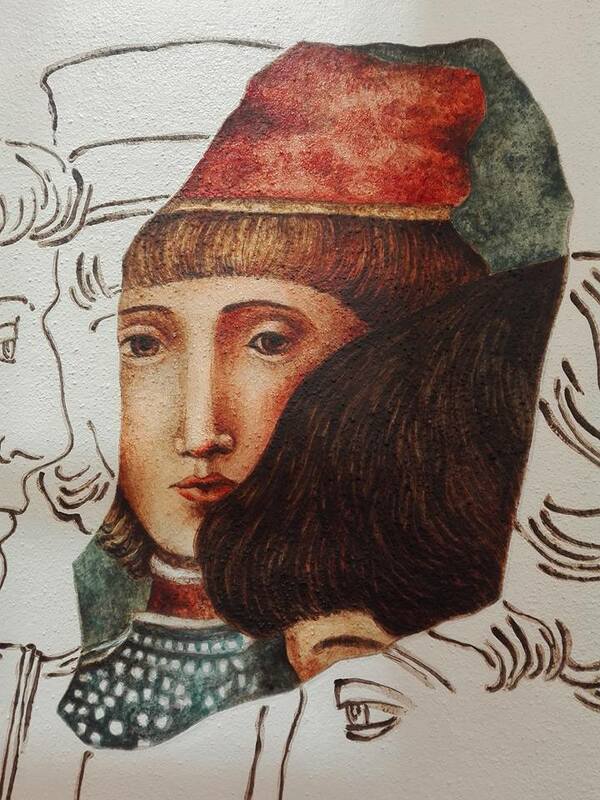 The fragments of the original frescoes, created many centuries ago by famous painters such as Jacopo Da Montagnana (1440/1499) and Pomponio Amalteo (1505/1588), are nowadays preserved in the City Museum. 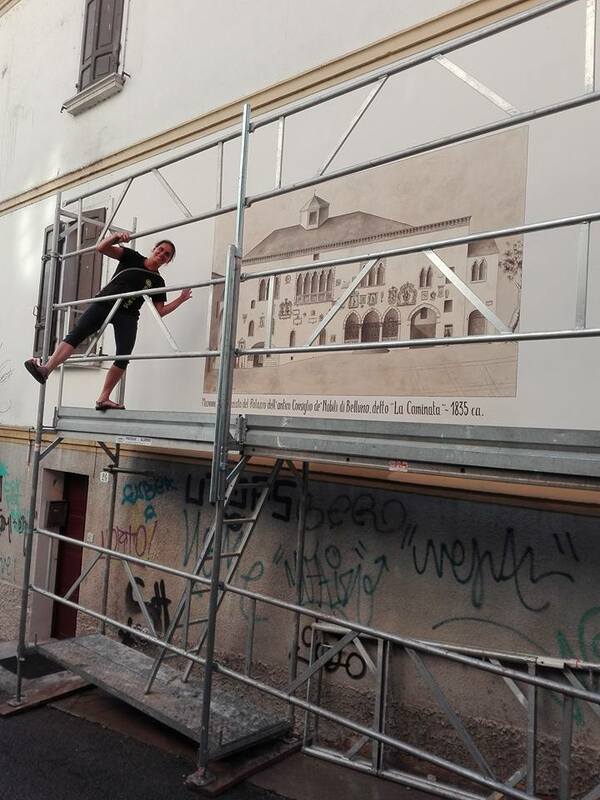 On the biggest wall I reproduce the facade of the ancient building called CAMINATA, which was once one of the finest architectures that my hometown owned. 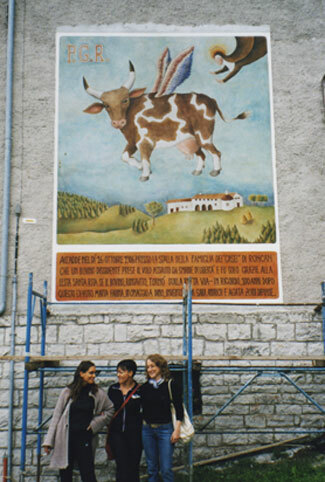 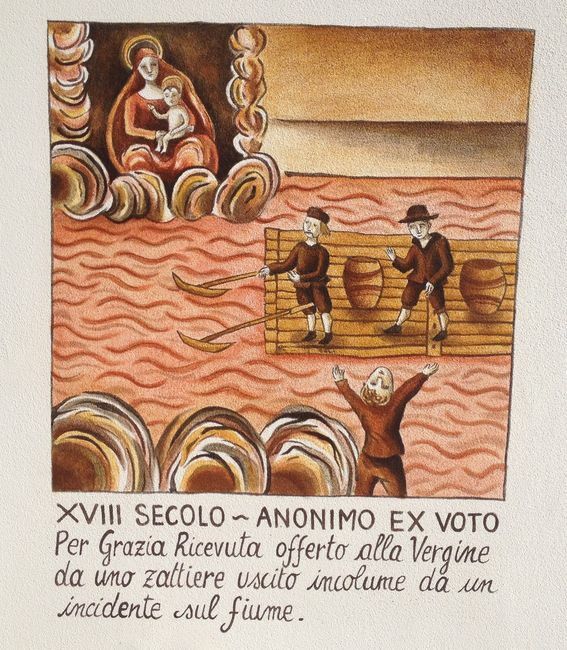 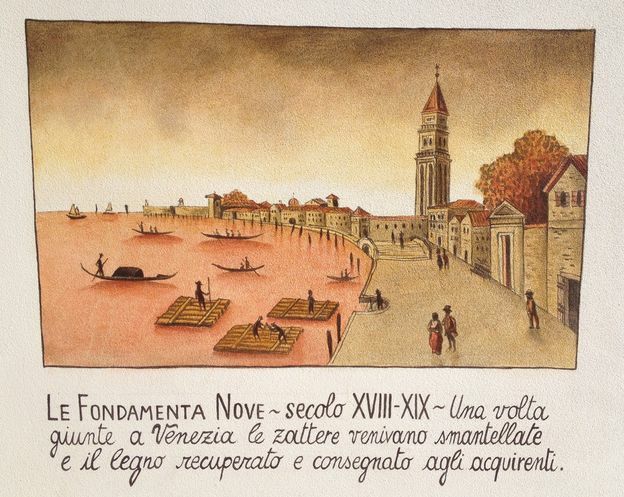 It was right in that building that were painted the cycles of frescoes of which only few traces remain. 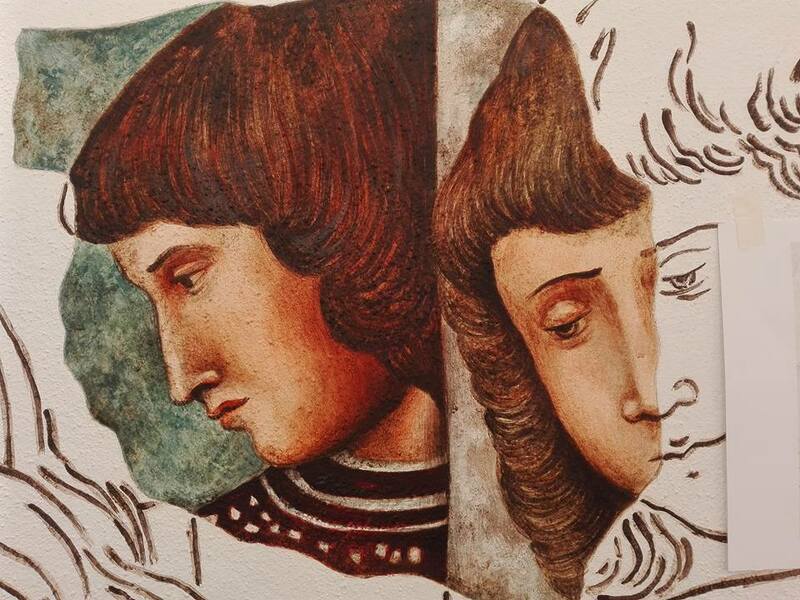 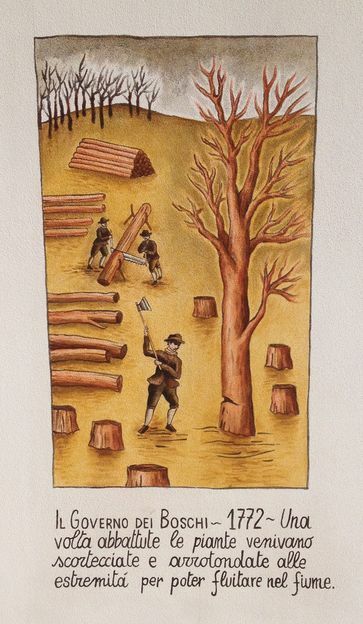 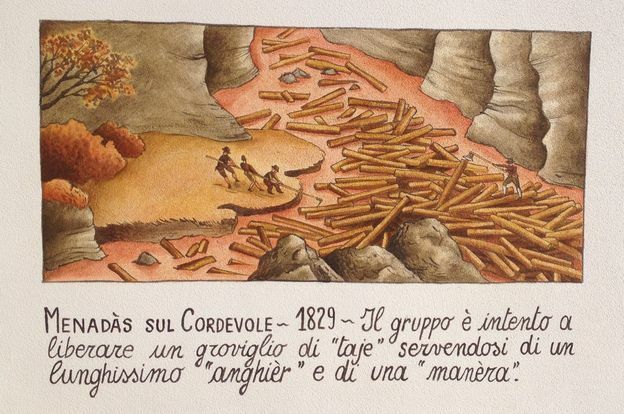 This work is dedicated to all the wonders of art lost in past centuries and that we can no longer to admire. 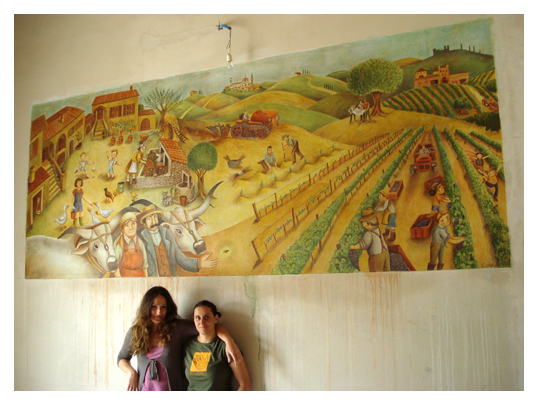 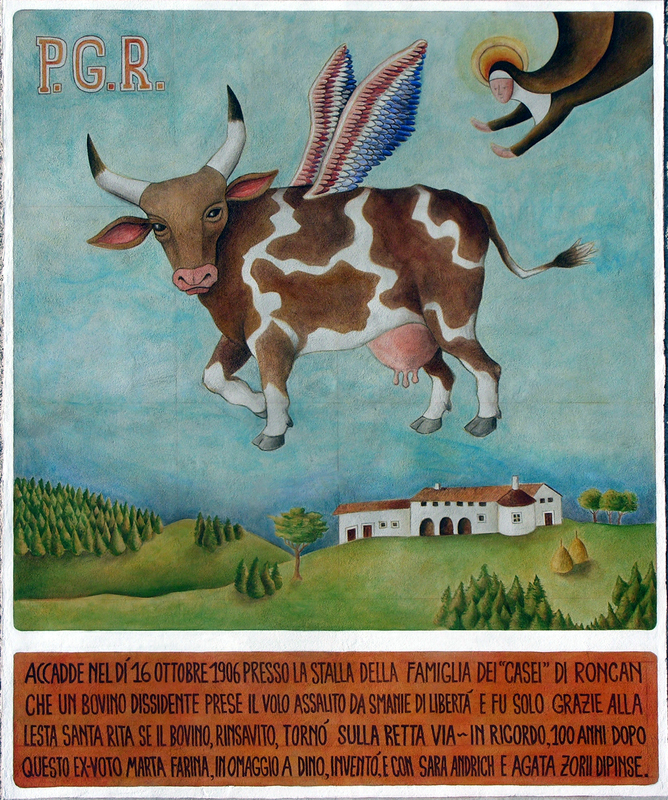 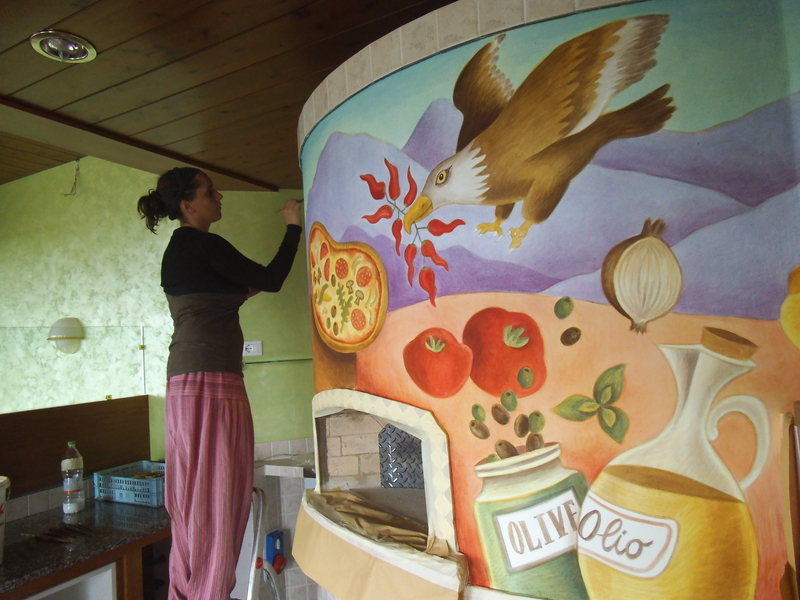 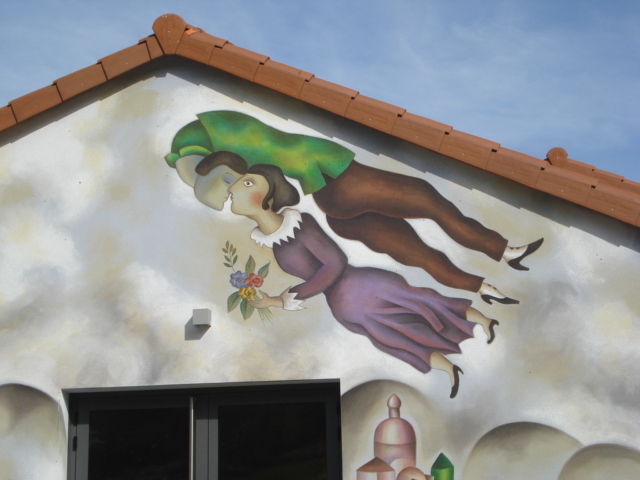 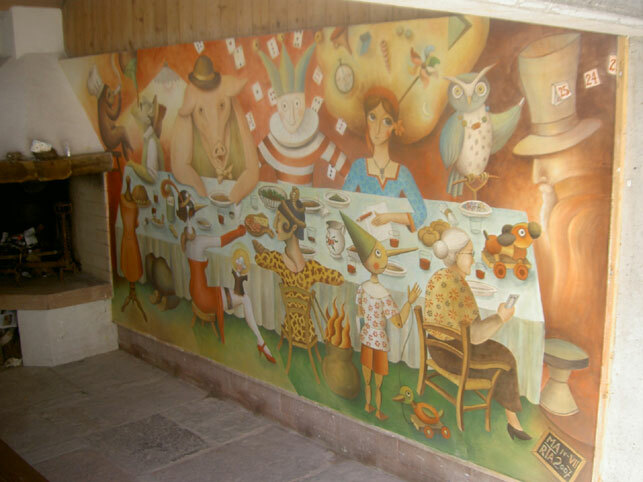 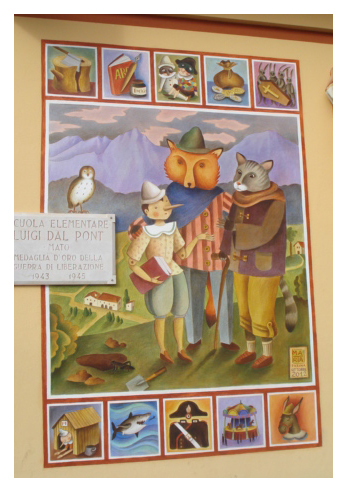 All my murals and frescoes were made with the use of powder pigments, mostly natural, that come from various parts of Italy. 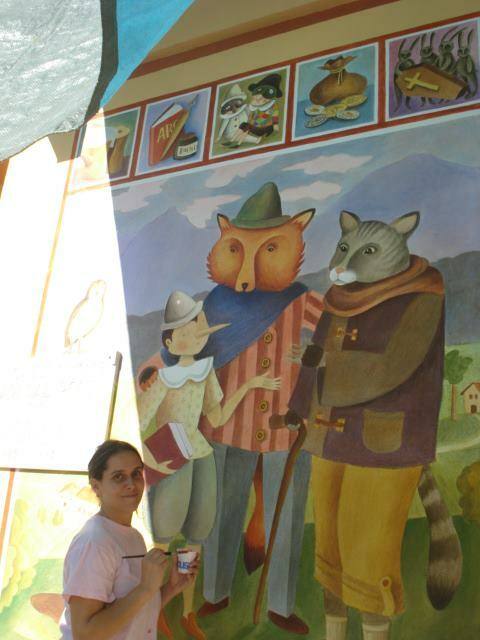 These are all works done for schools, festivals, libraries, families, private and public customers. 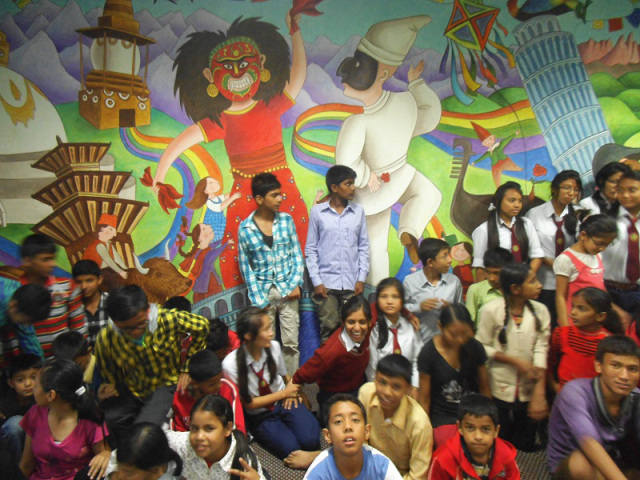 In 2013 I spent about three months in Nepal, during which I lived in a school in the village of Kirtipur (not far from Kathmandu). 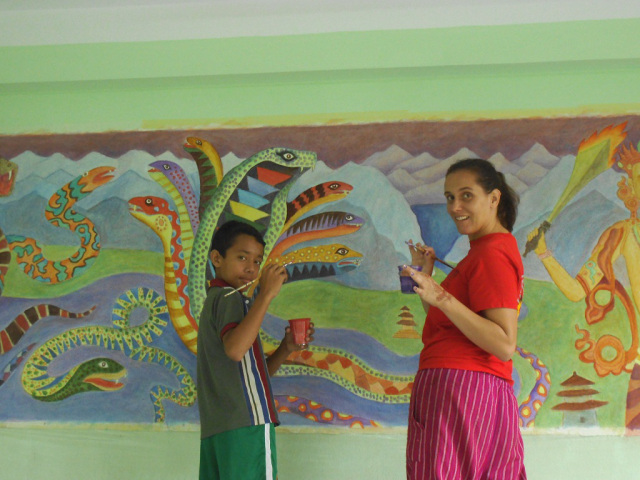 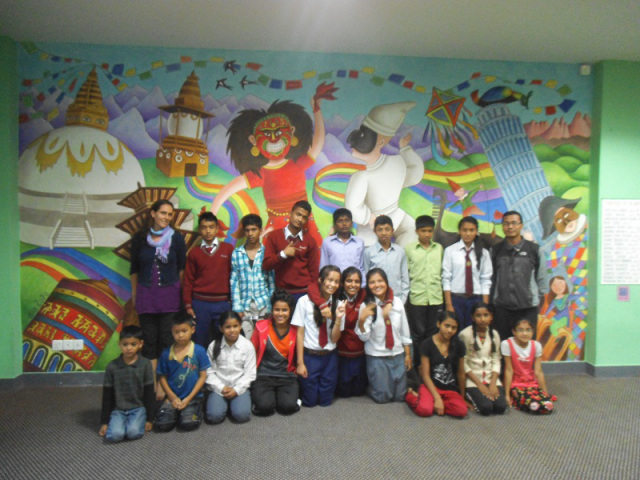 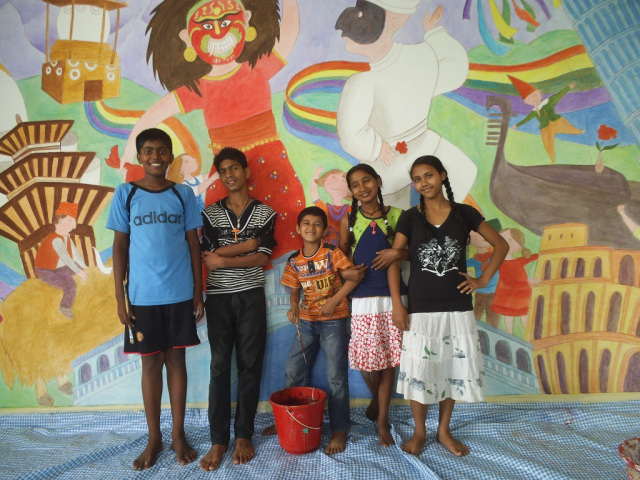 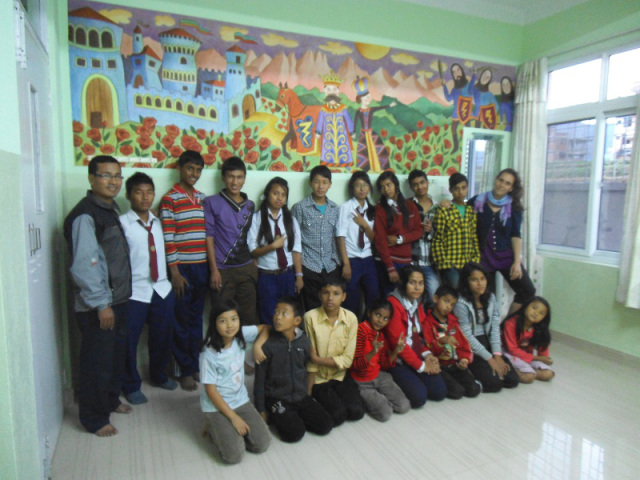 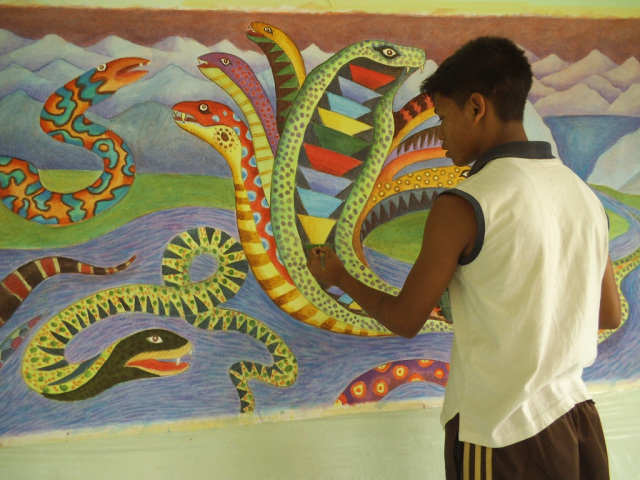 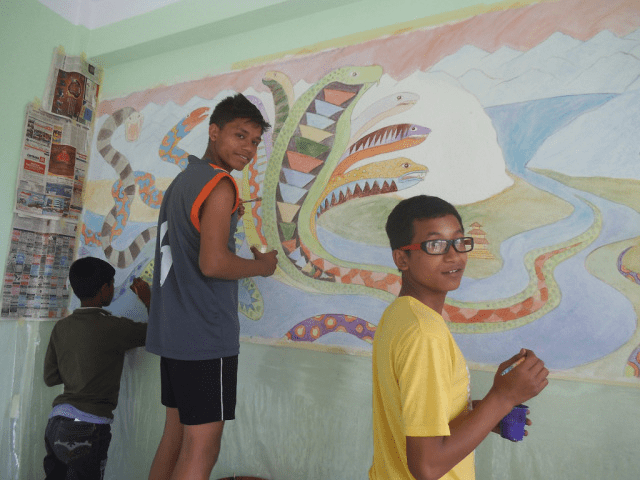 There, I taught mural painting to the children and young people who attended the college. 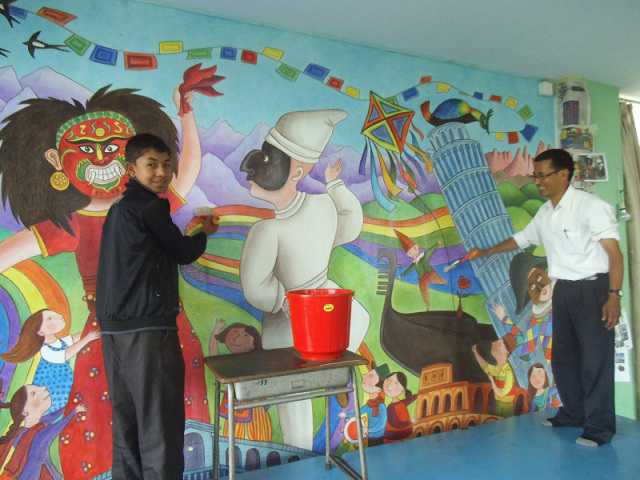 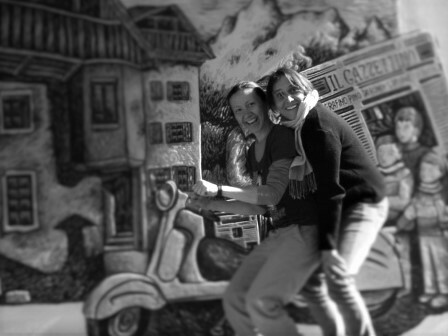 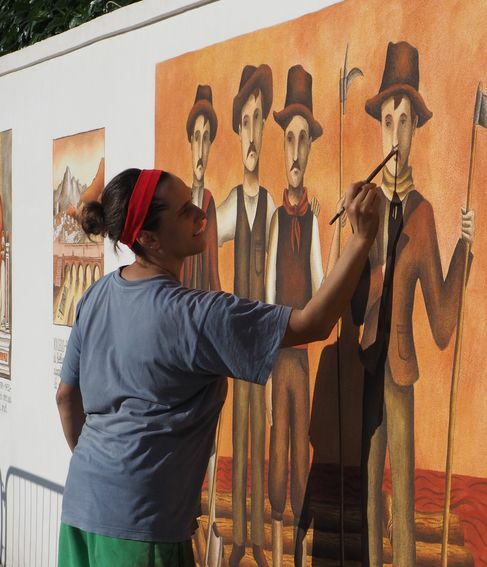 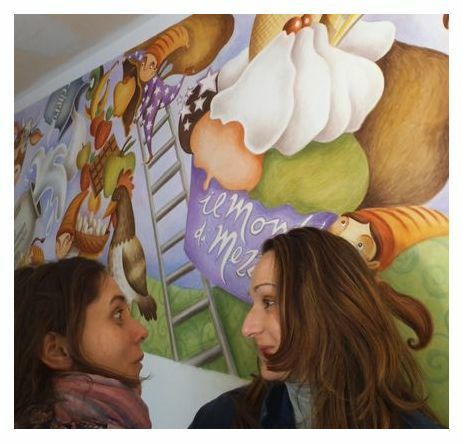 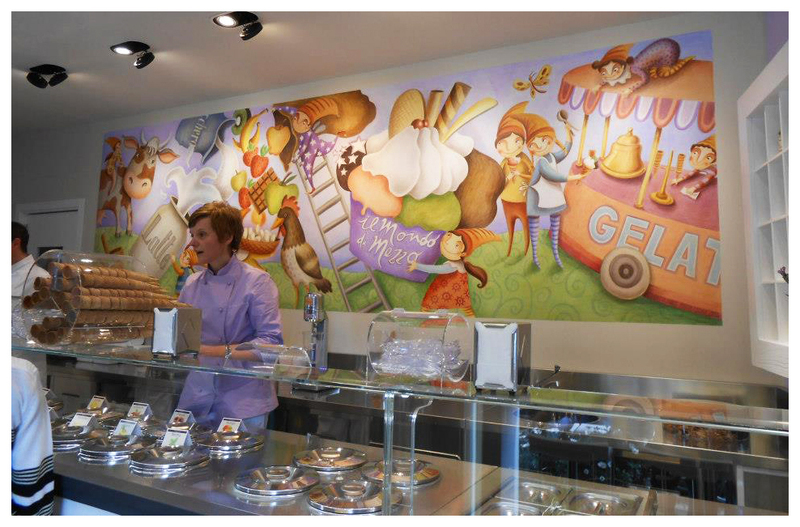 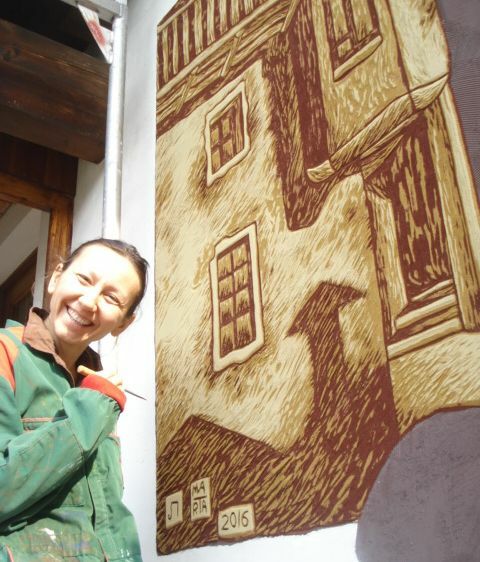 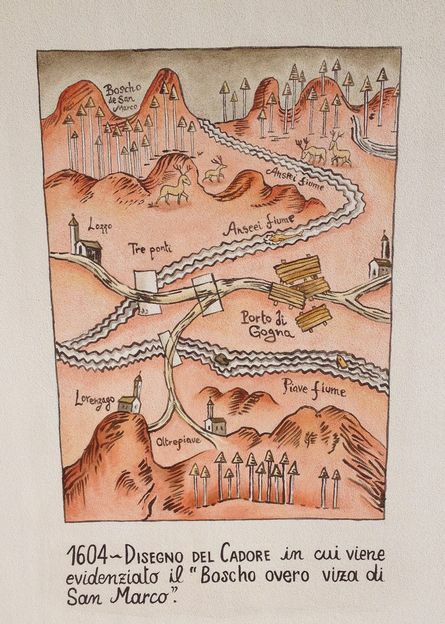 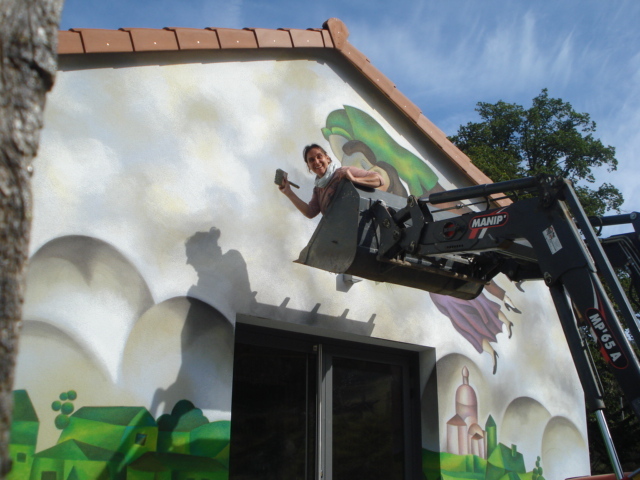 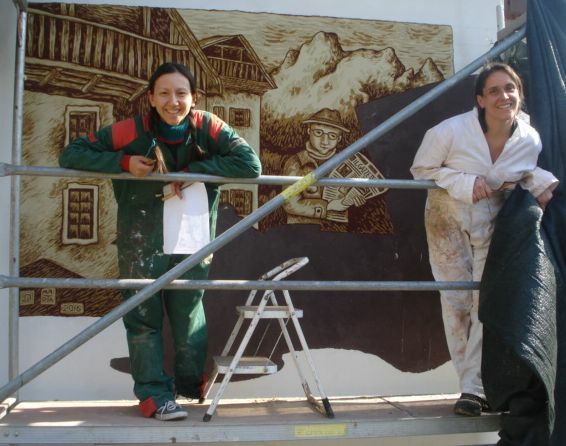 Working for many weeks we were able to paint three murals with these themes: the legend of the Dolomites rose garden, the legend of the birth of the Kathmandu valley and on the meeting between different cultures. 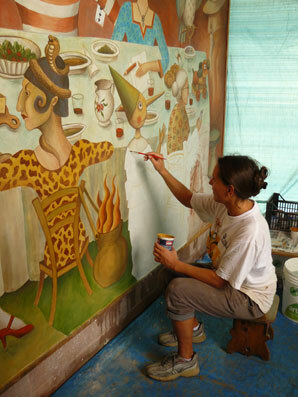 Painting with other artists is always fun and it is a way to learn from the other, in any case. 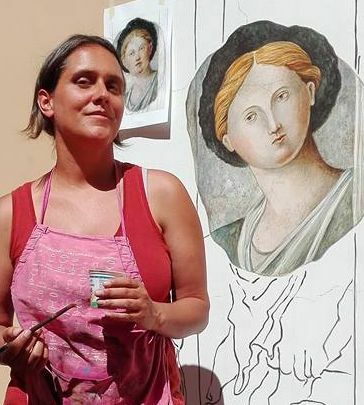 I have worked in recent years with several artists, among them: SARA ANDRICH, CARLOTTA PARISI and DUNIO PICCOLIN (Italy), AGATA ZORII (Poland), LIUBA NOSOVA (Russia). 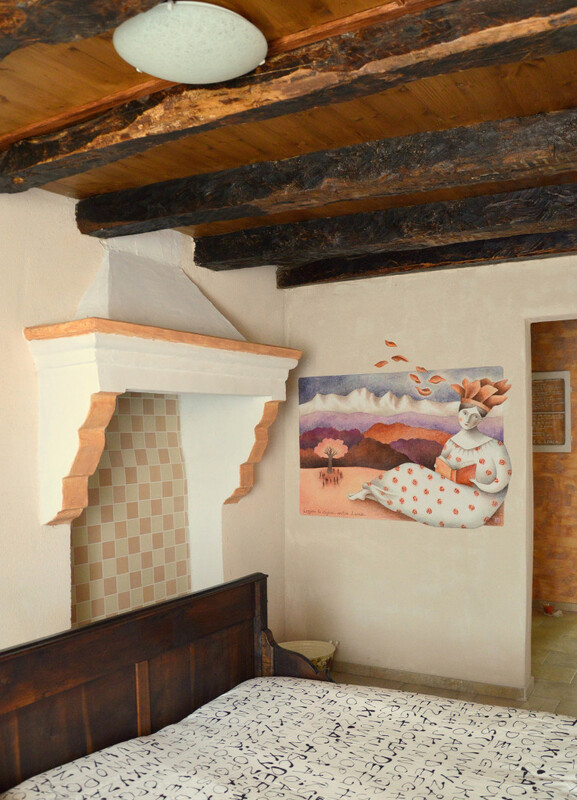 A brief gallery with some decorations of mine, made in or out of private houses, bed & breakfast, restaurants. 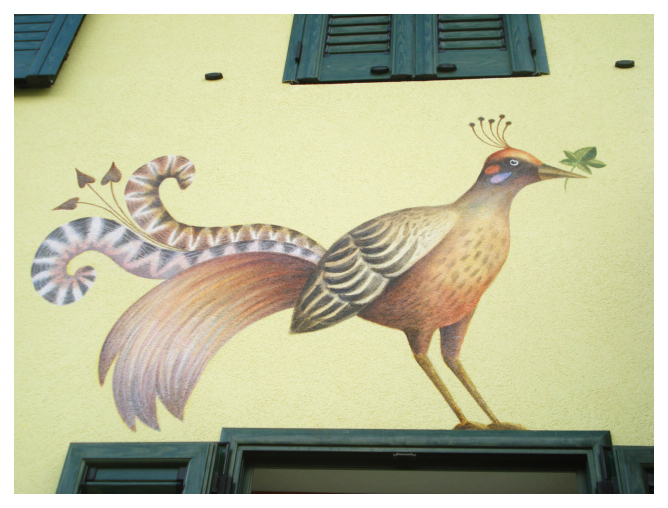 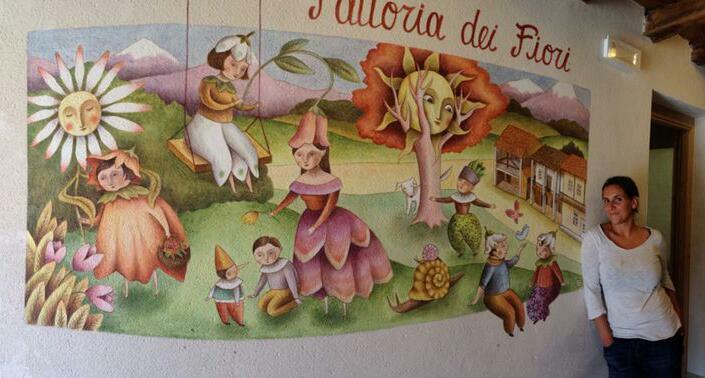 All these decorations are located in Belluno area (Italy). 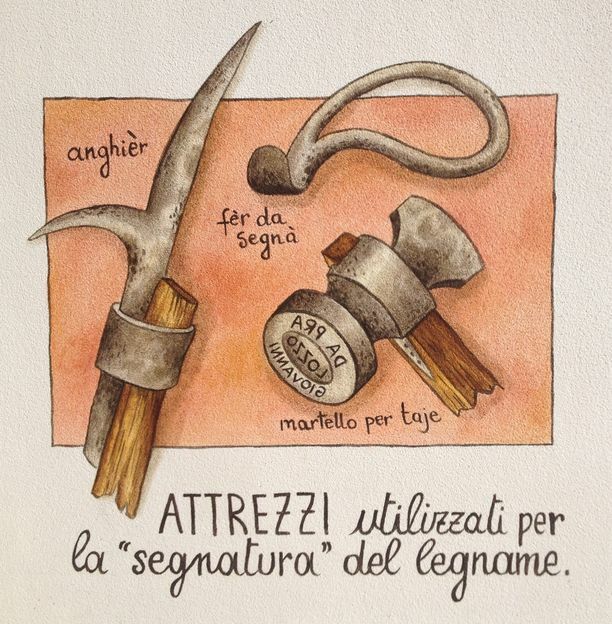 Copyright © 2018 MARTA FARINA, all rights reserved.